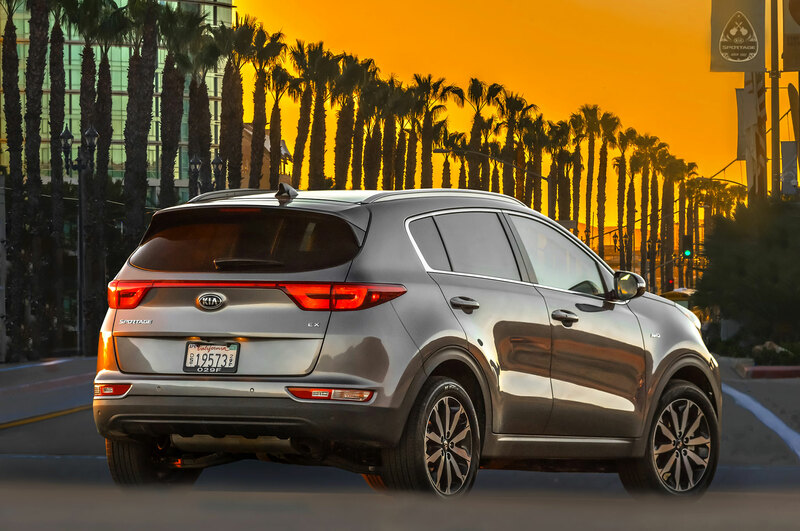 EL SEGUNDO, California — Need a little lift? 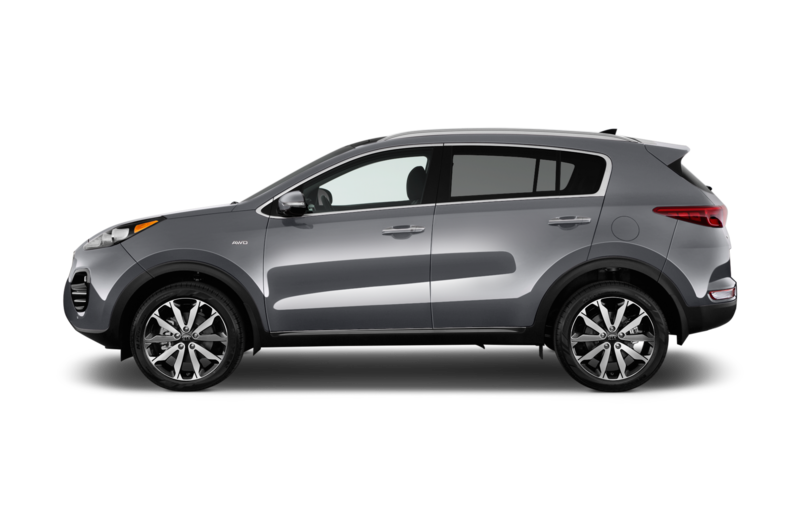 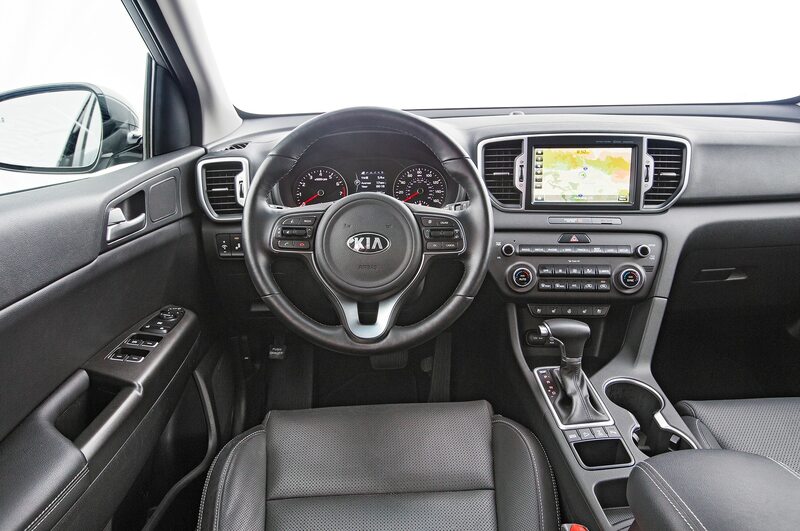 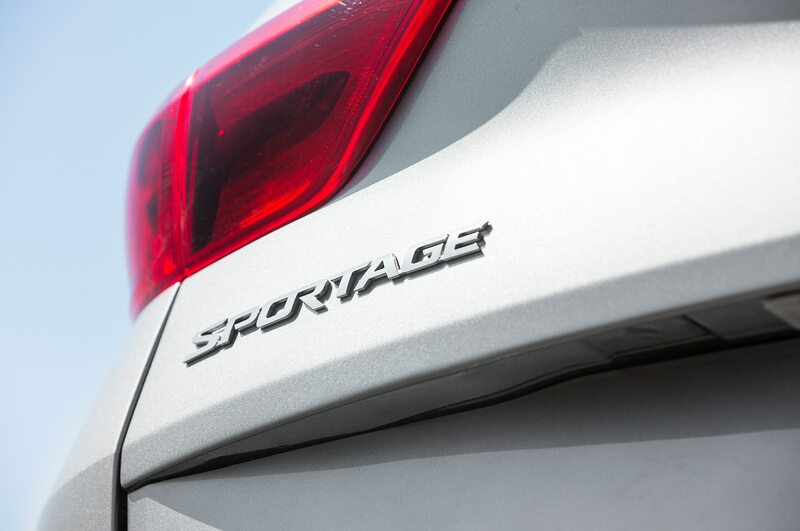 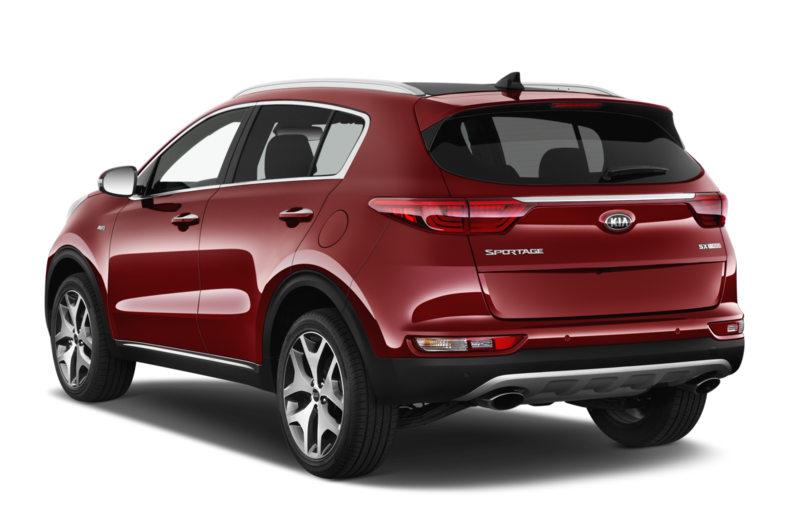 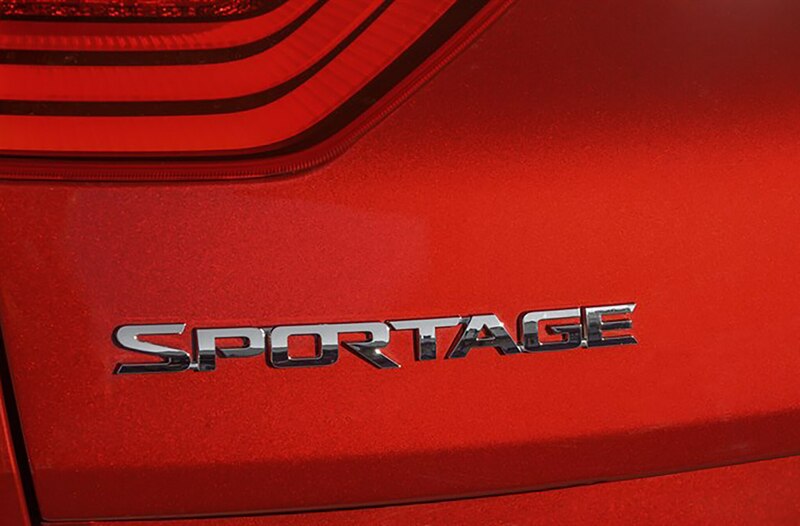 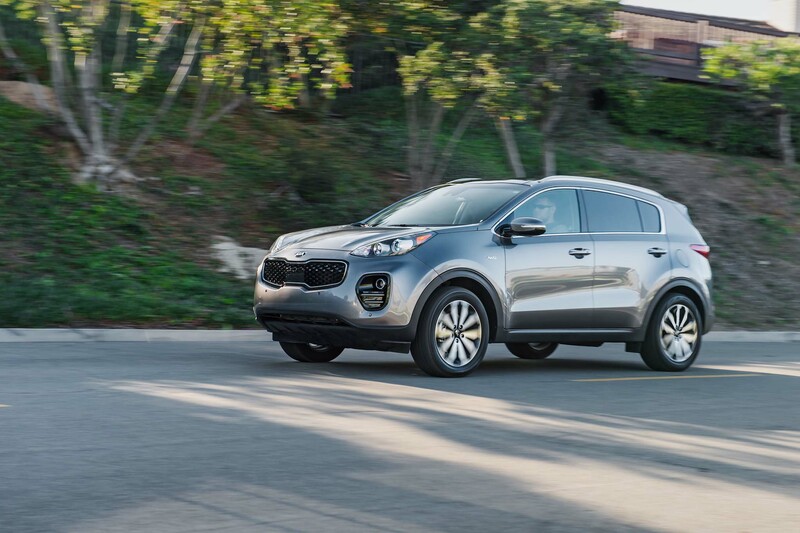 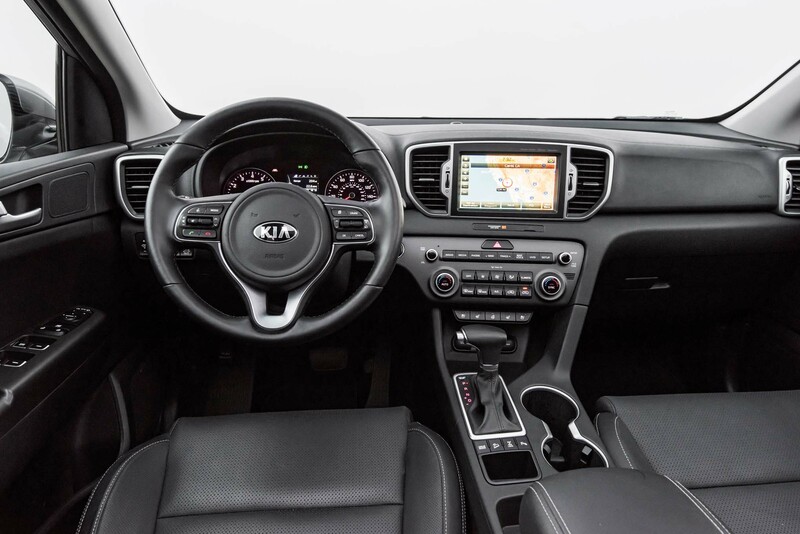 The 2017 Kia Sportage SX AWD is a fun, functional option for enthusiasts, couples, and small families. 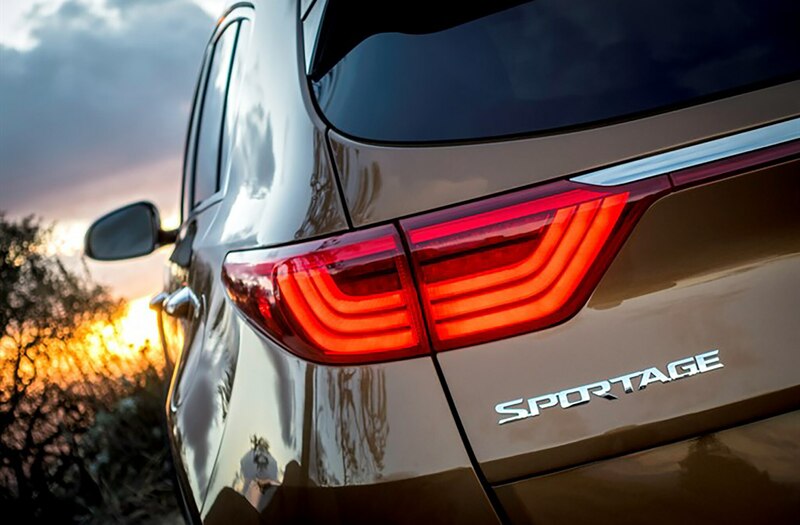 The sporty small SUV reminds us a little bit of the original first generation Toyota RAV4, except that it offers more room and better looks and handling. 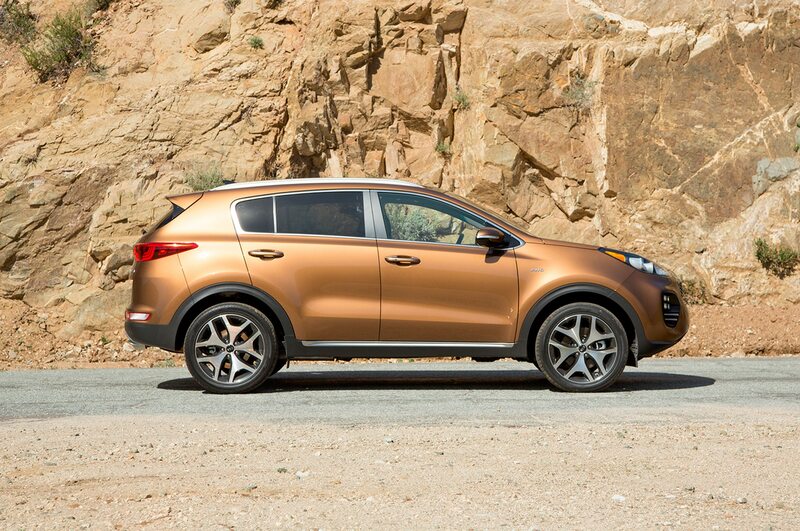 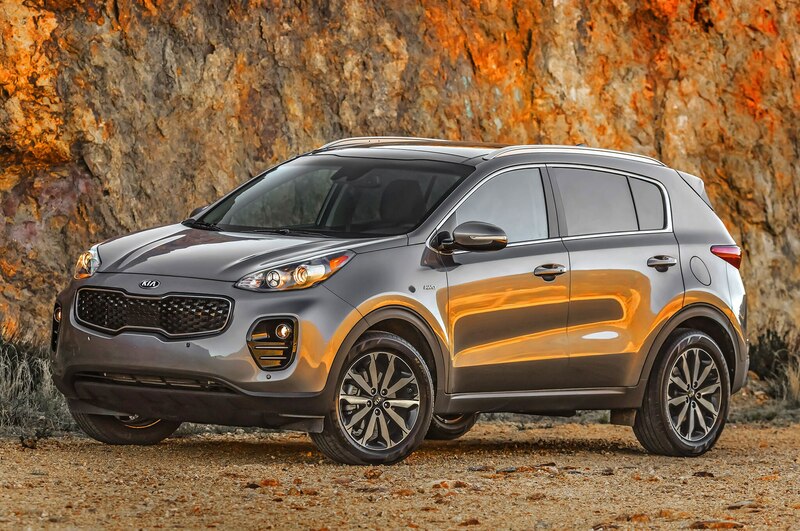 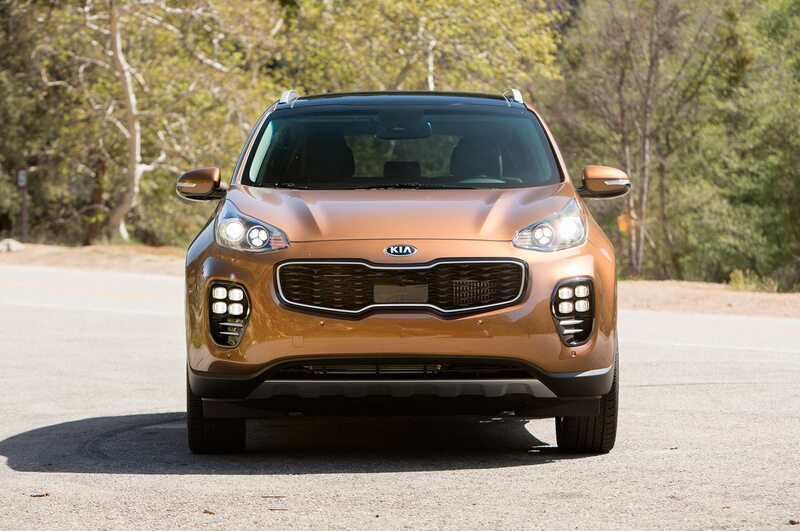 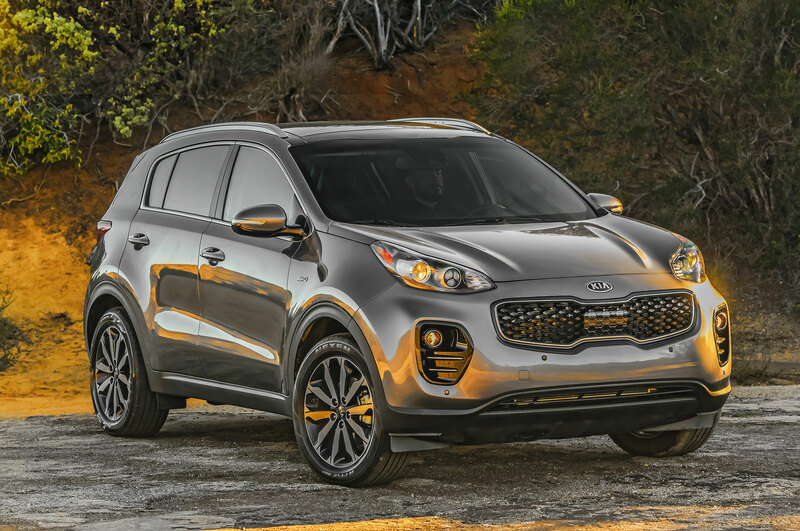 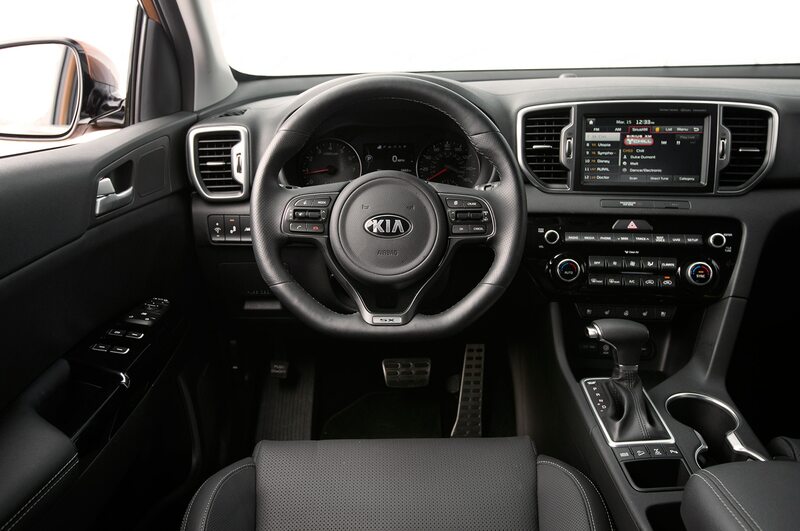 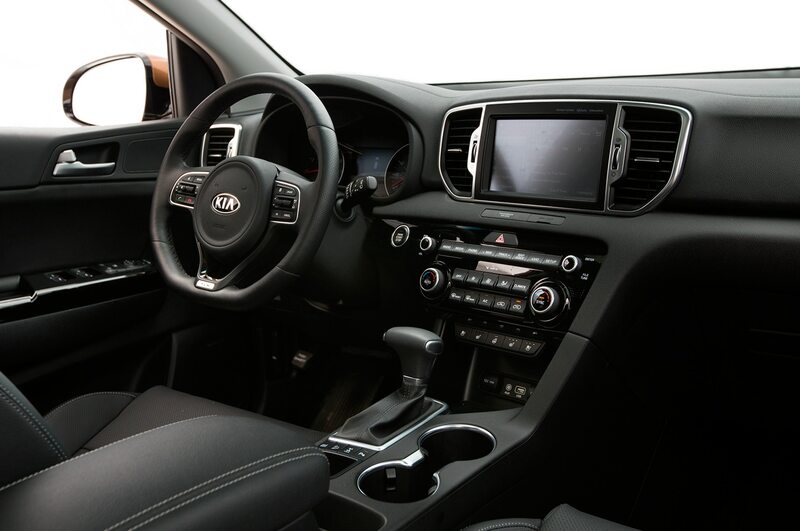 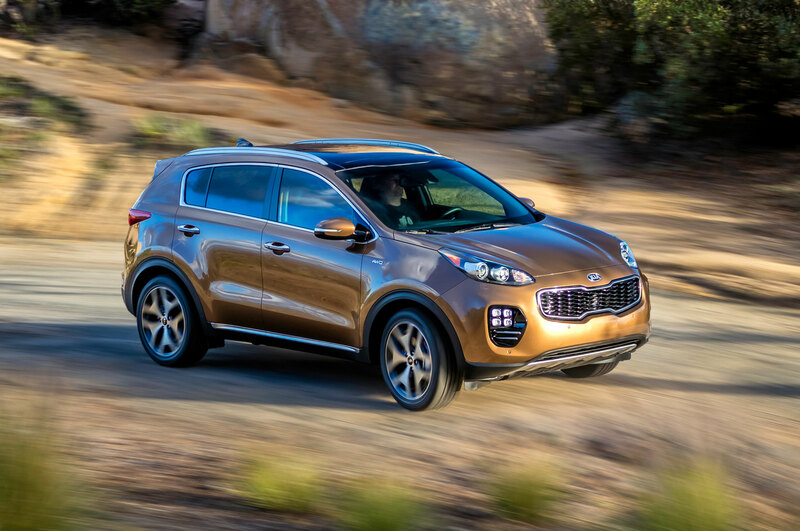 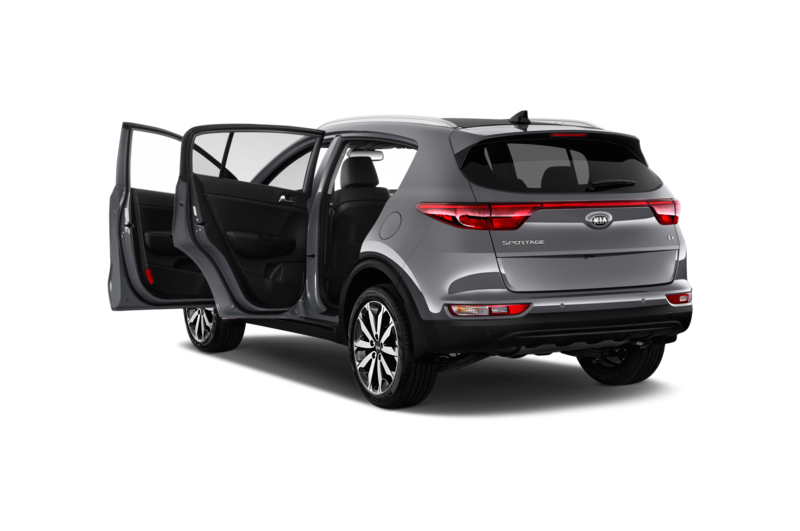 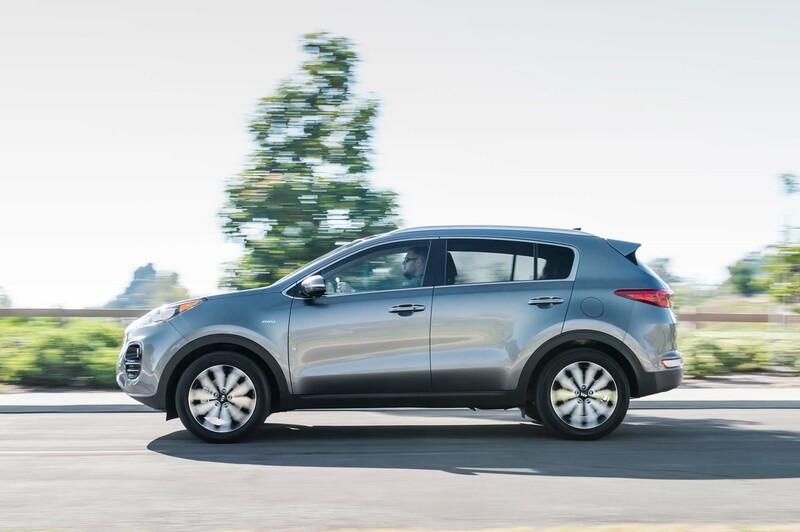 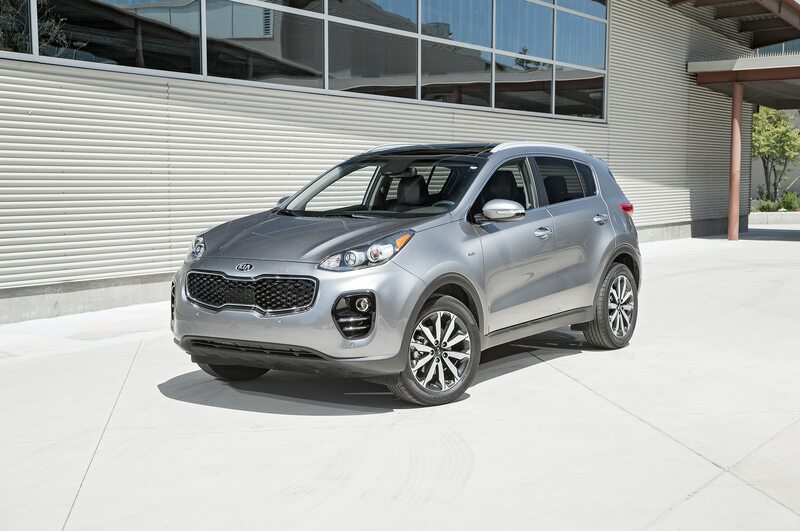 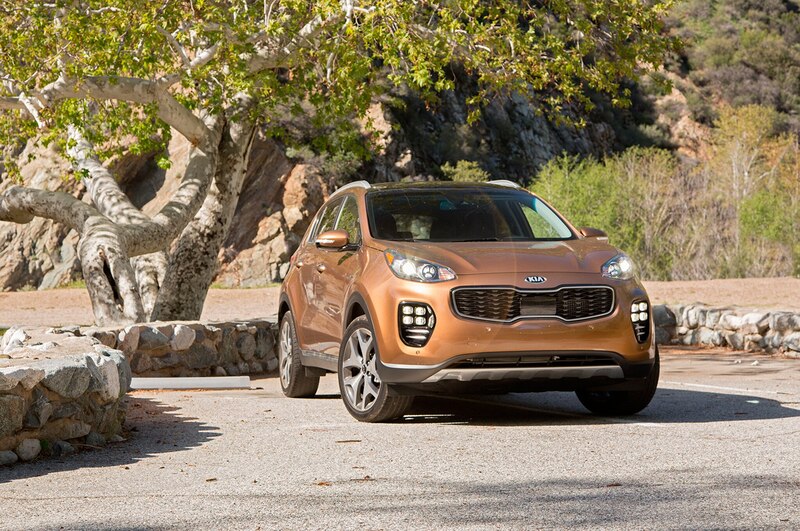 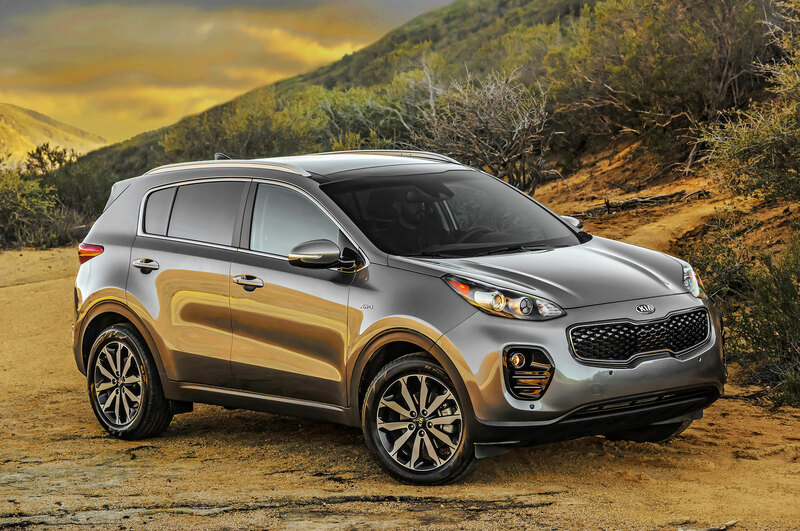 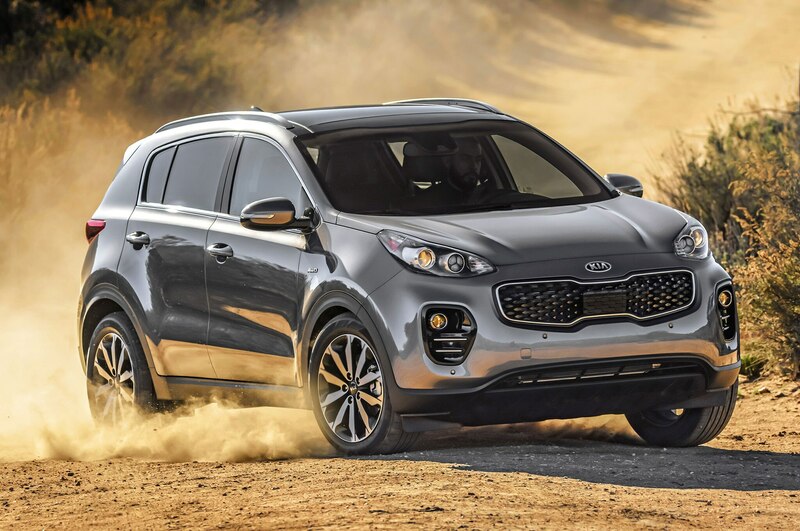 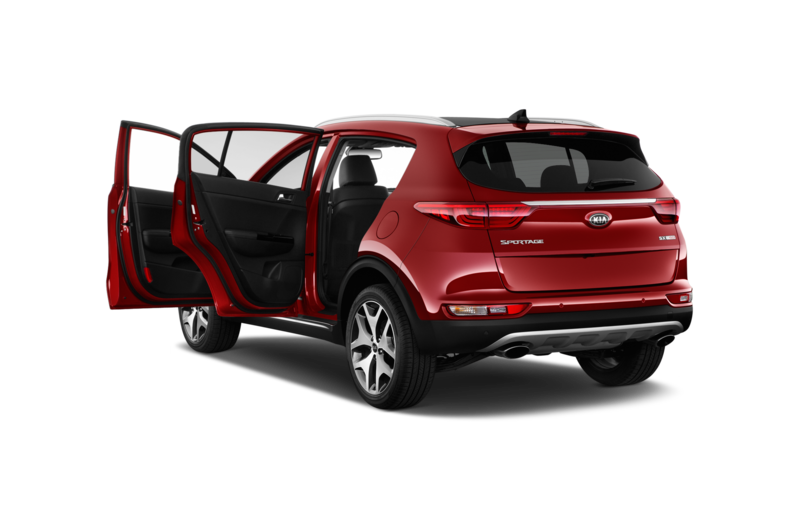 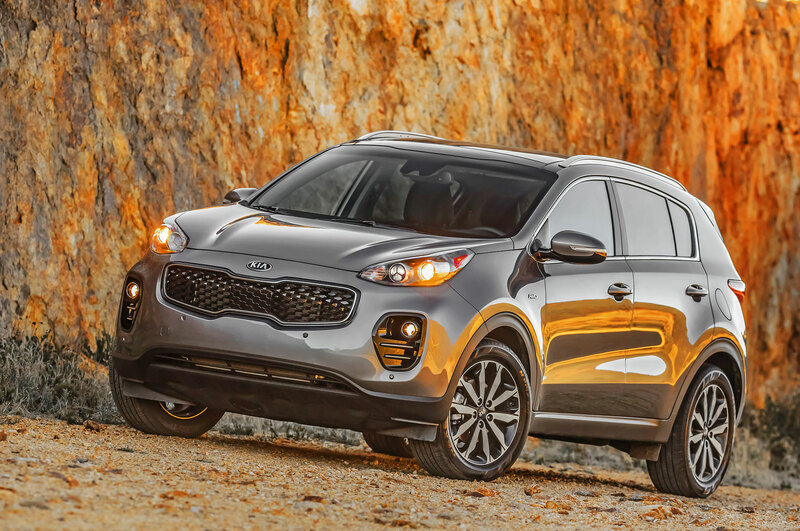 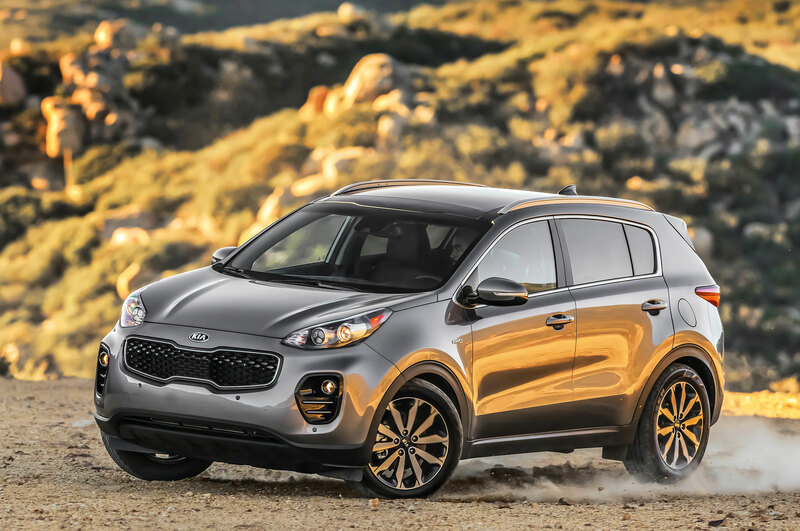 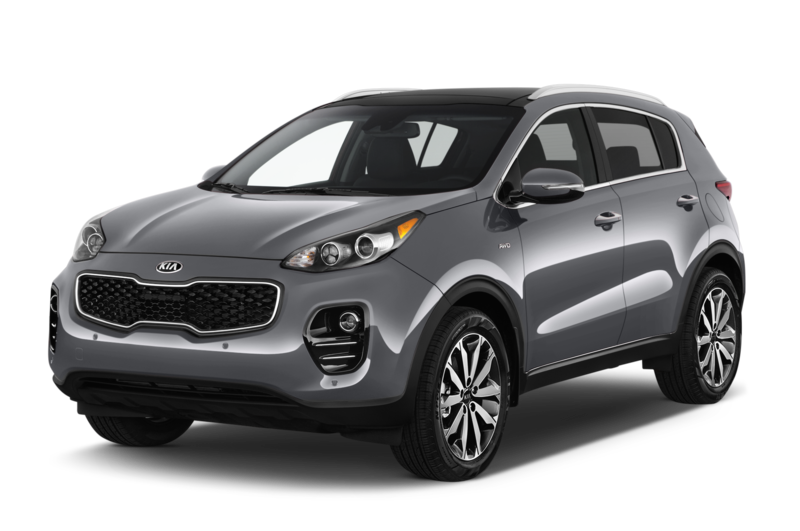 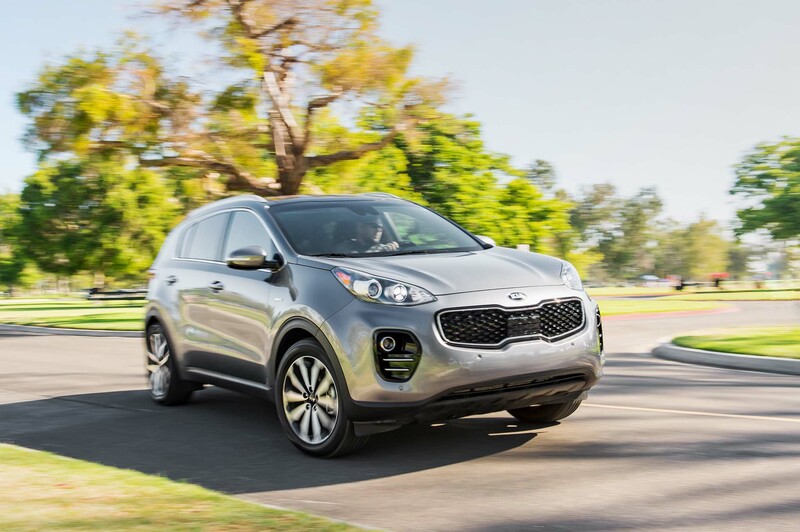 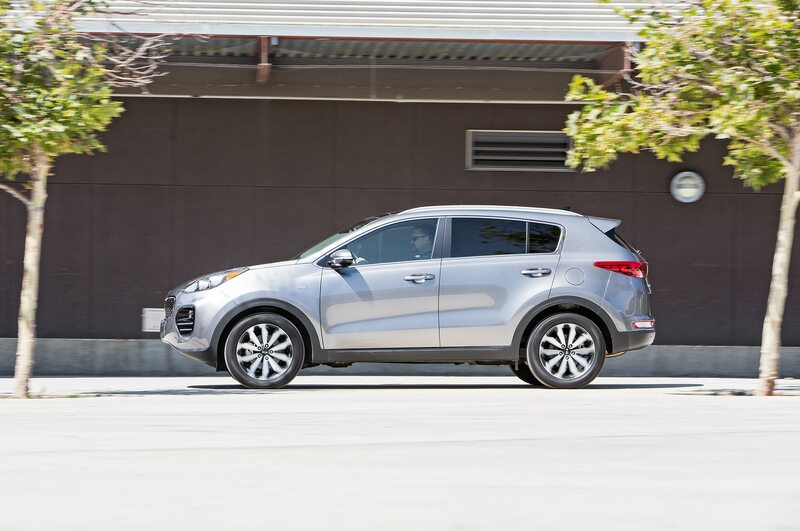 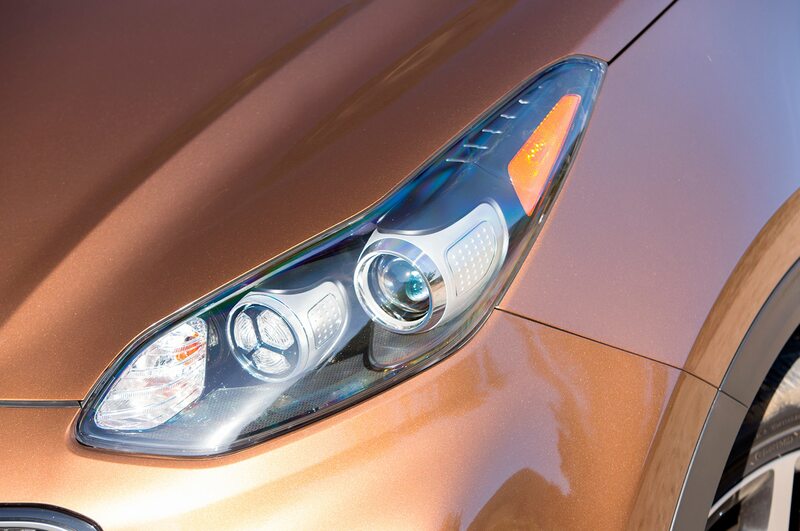 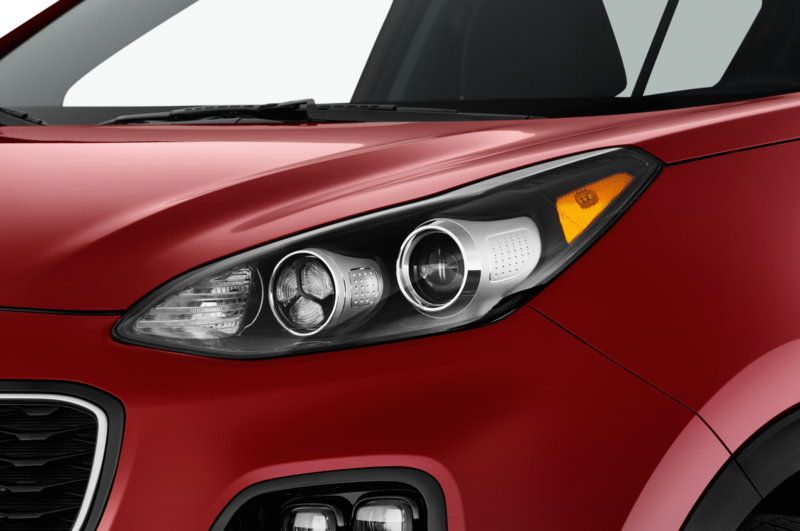 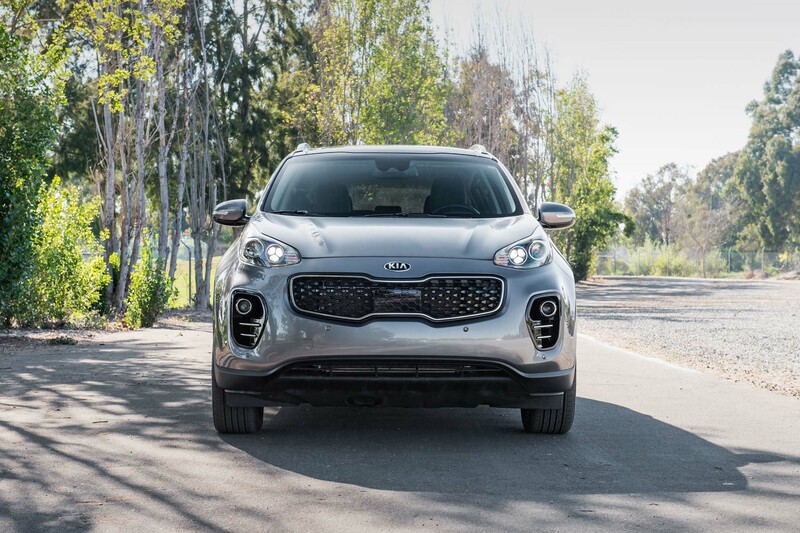 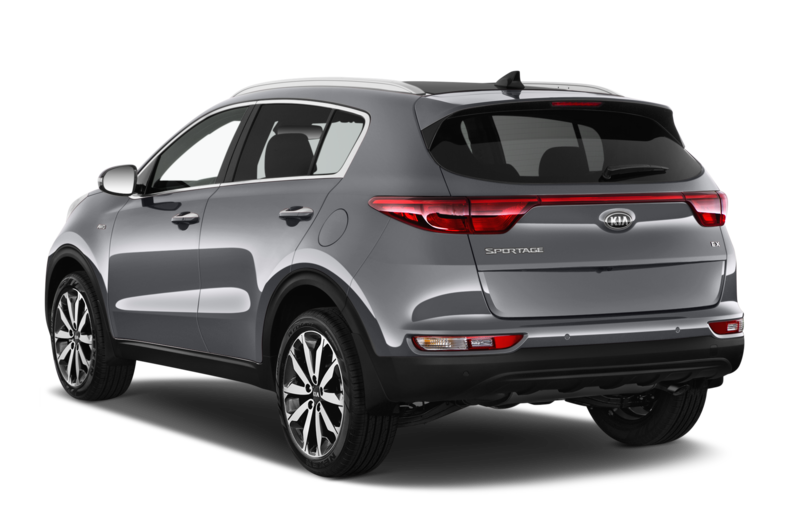 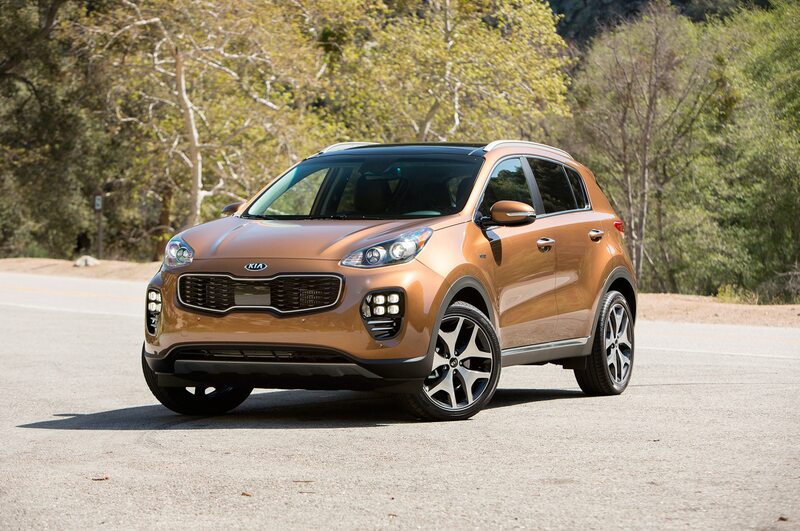 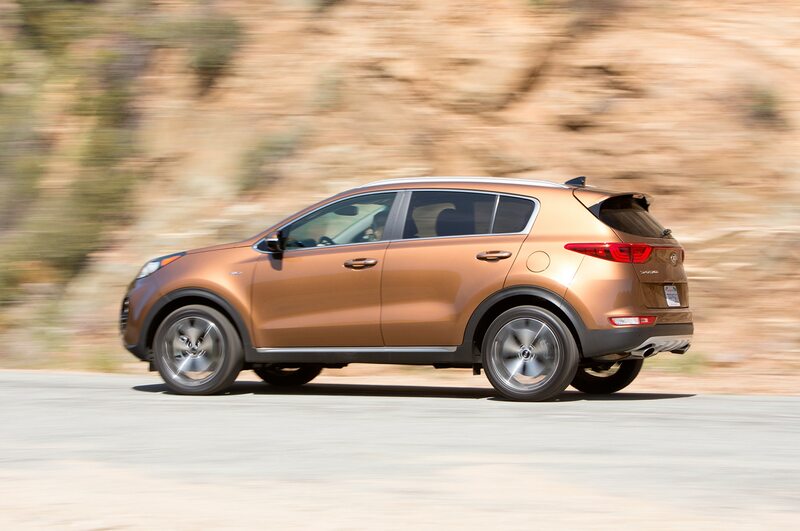 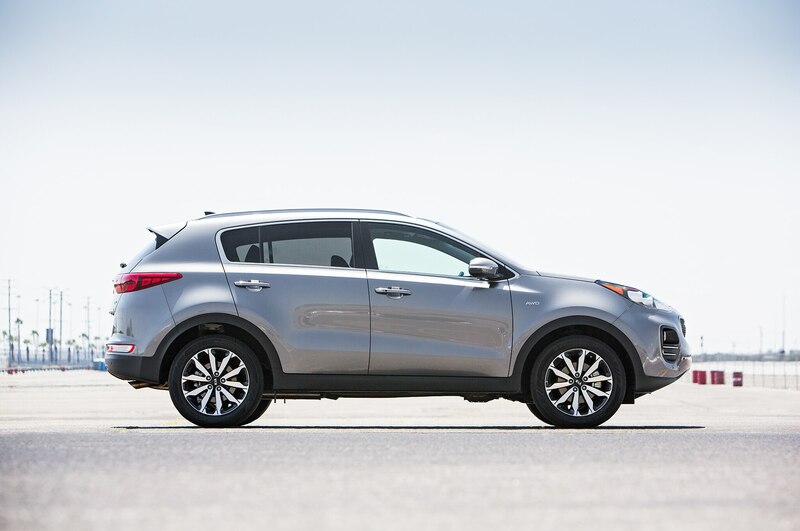 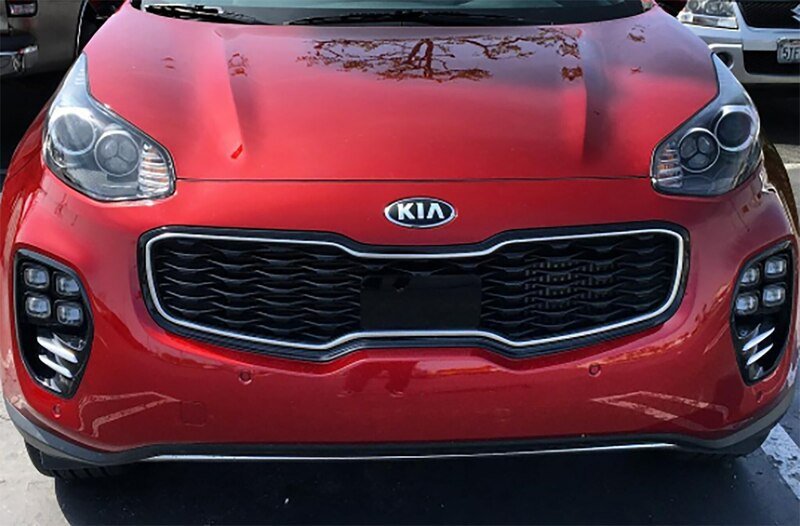 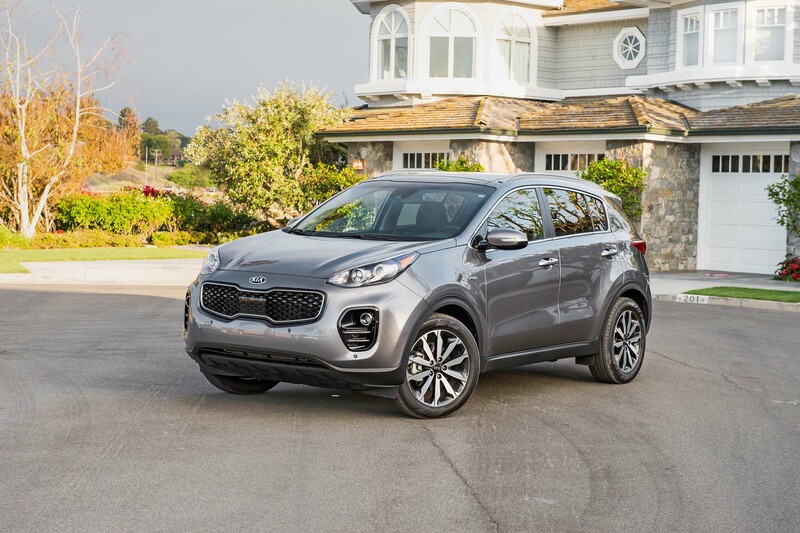 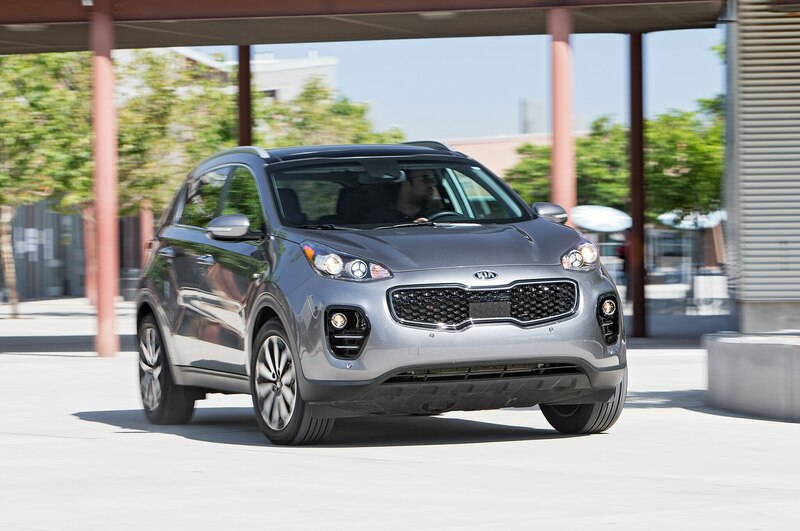 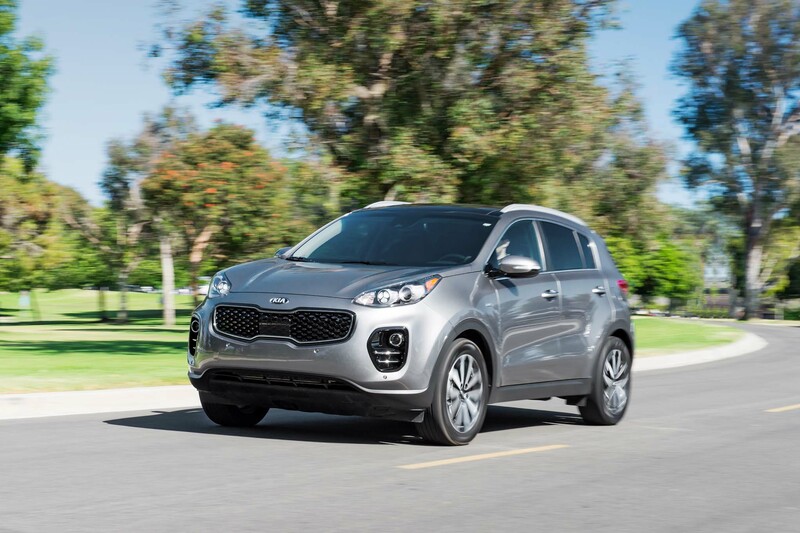 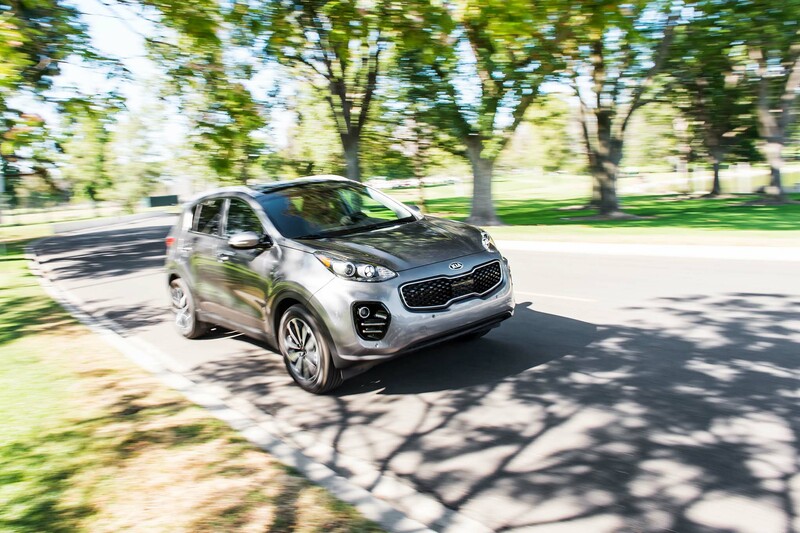 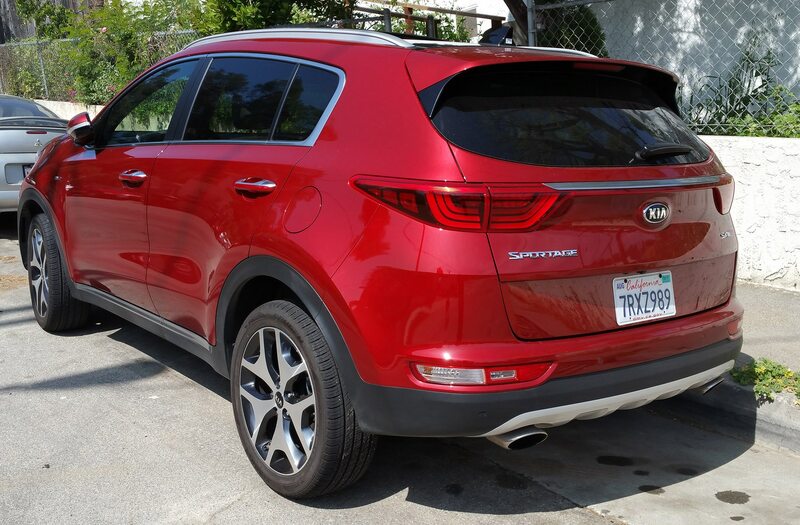 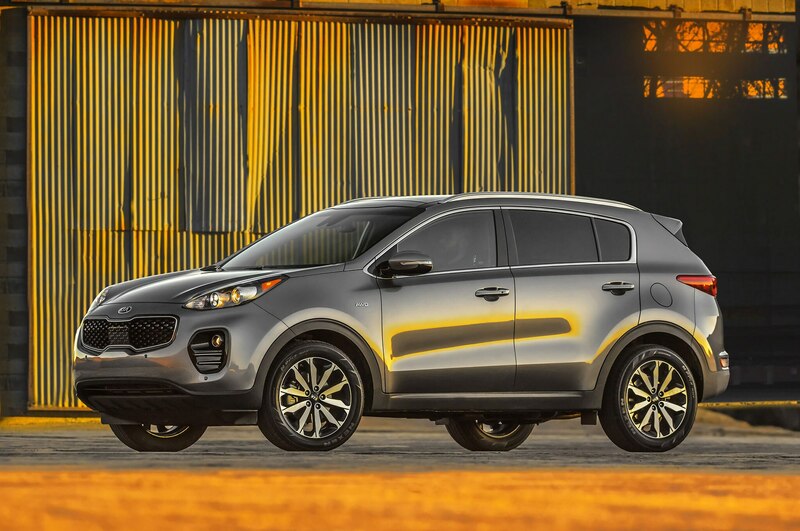 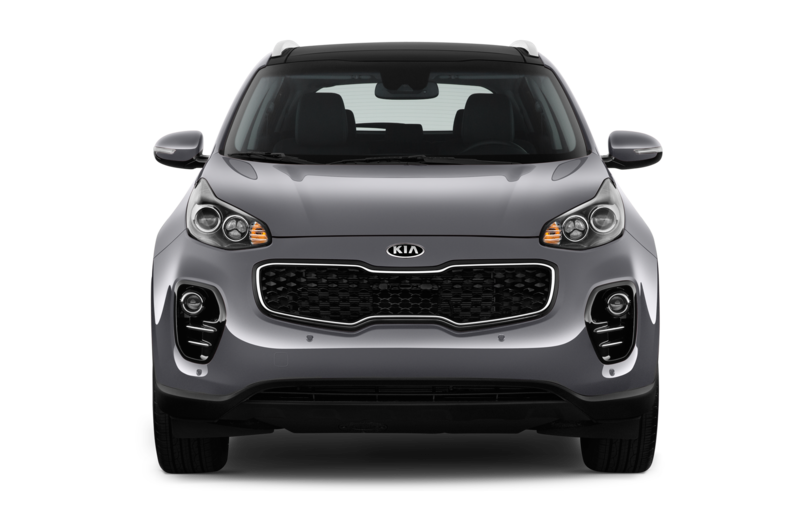 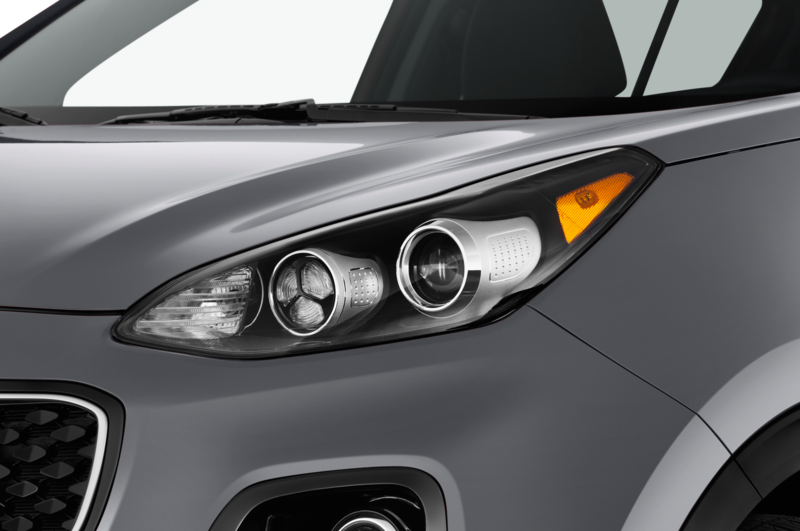 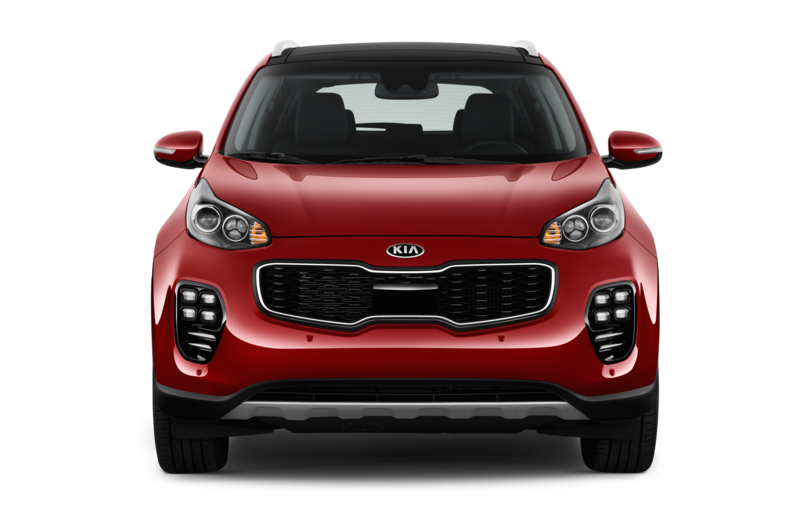 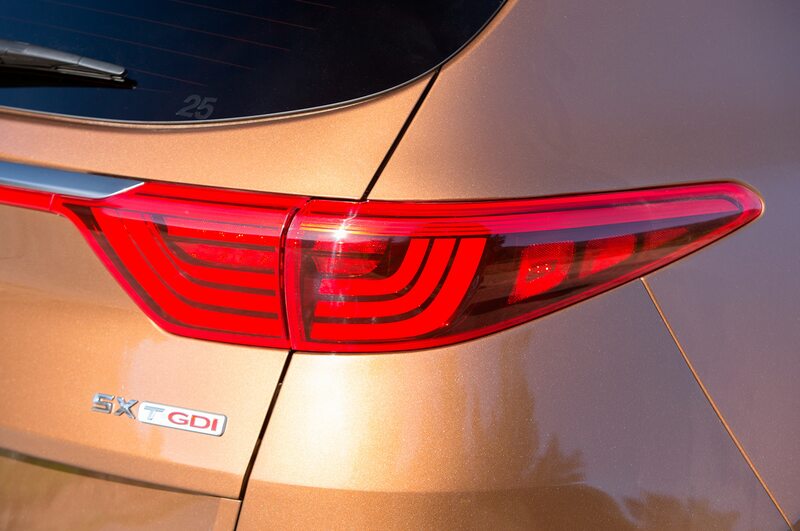 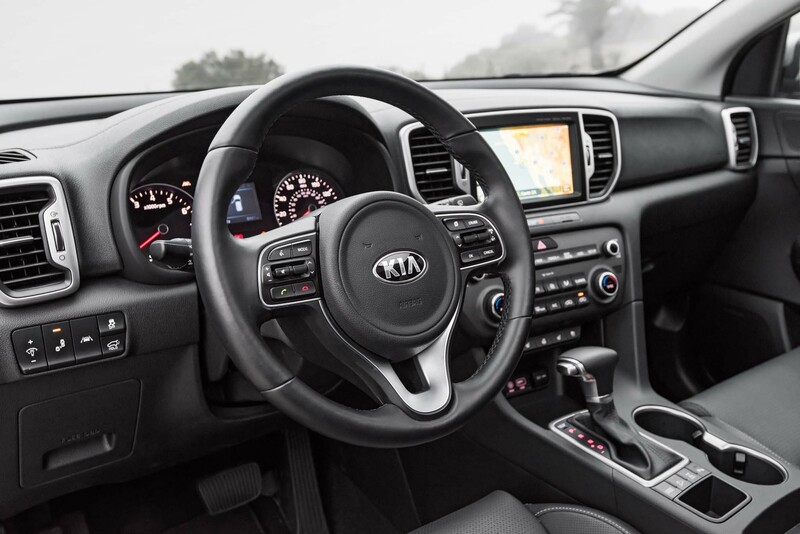 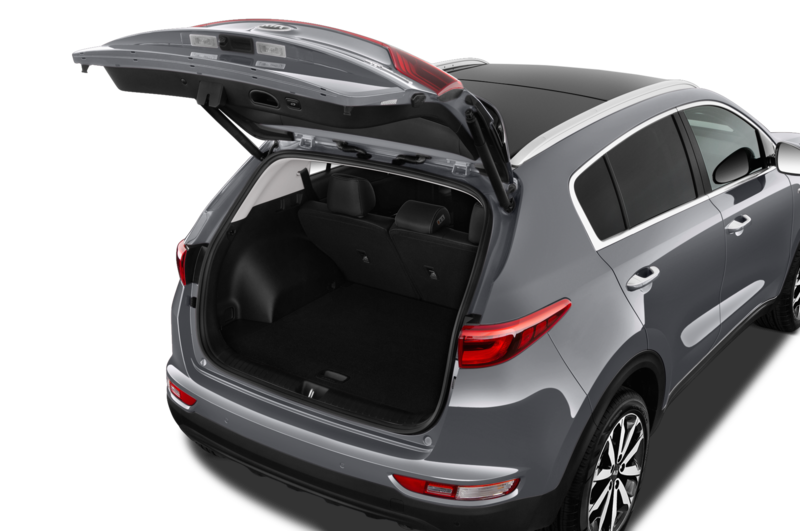 The SX is the top of the line trim of the new-for-2017 fourth-generation Sportage and we really like its funky tiger-nose grille, ice cube LED fog lights, panoramic sunroof, 19-inch wheels, and spirited driving experience. 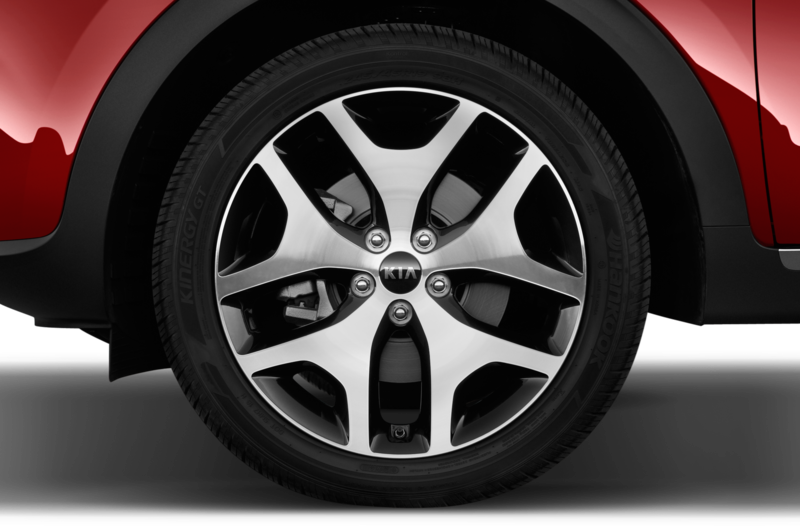 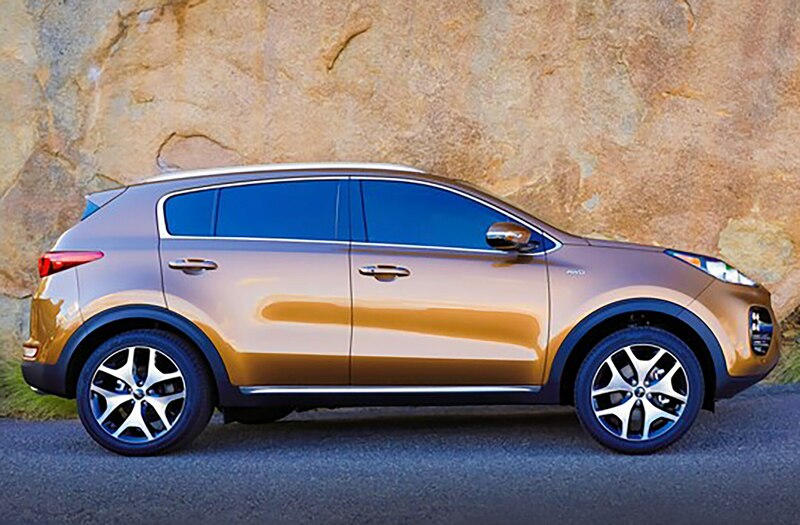 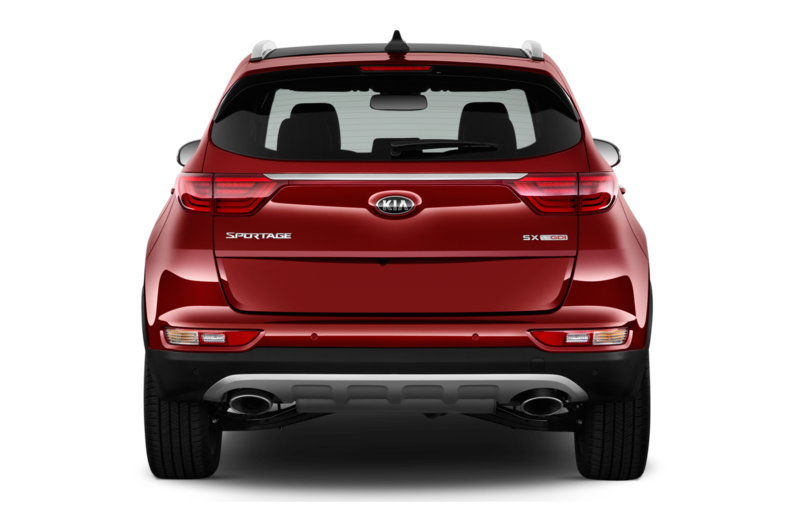 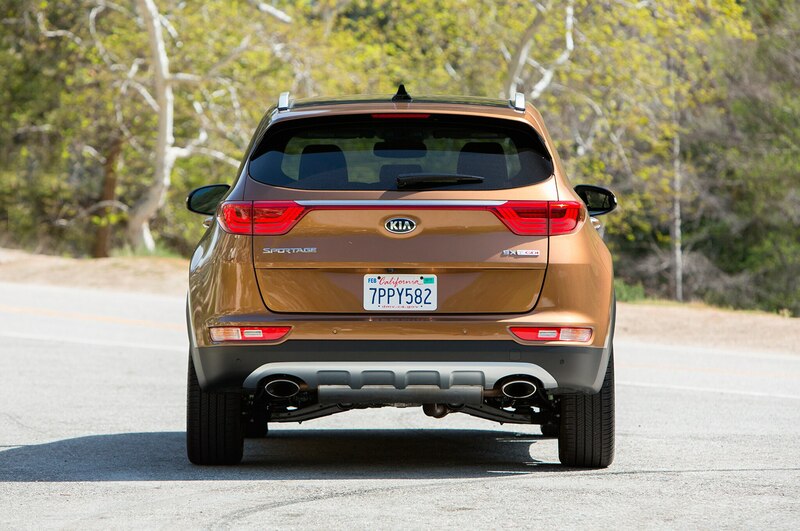 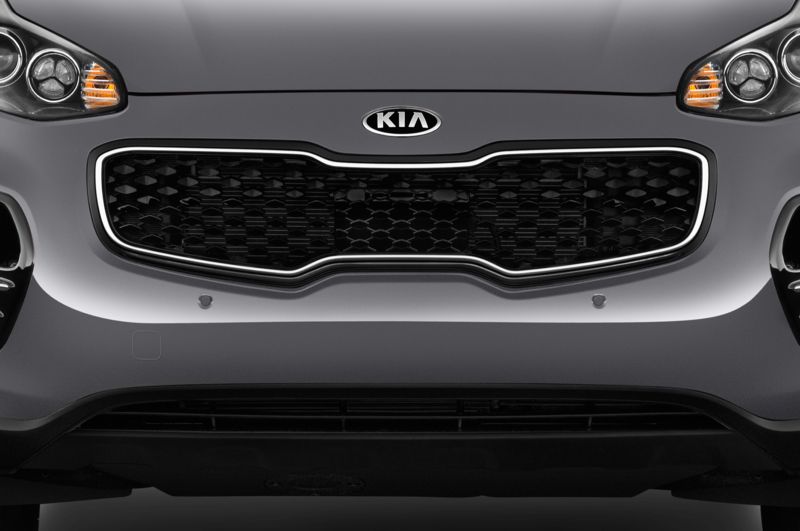 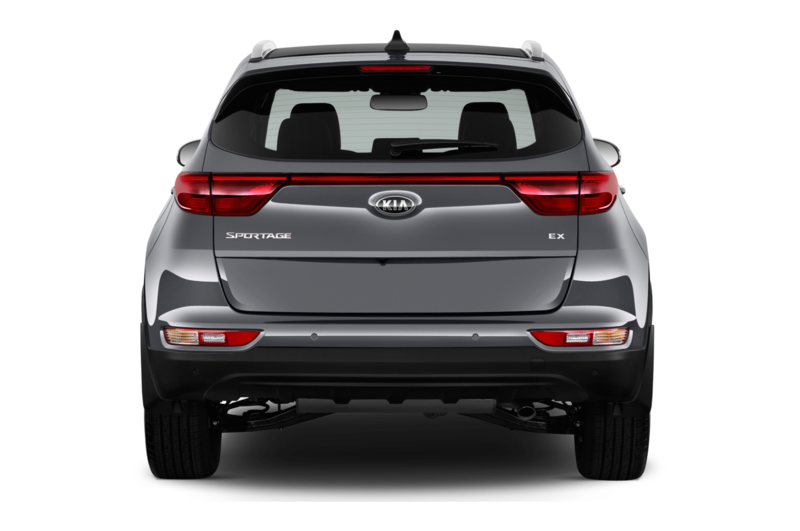 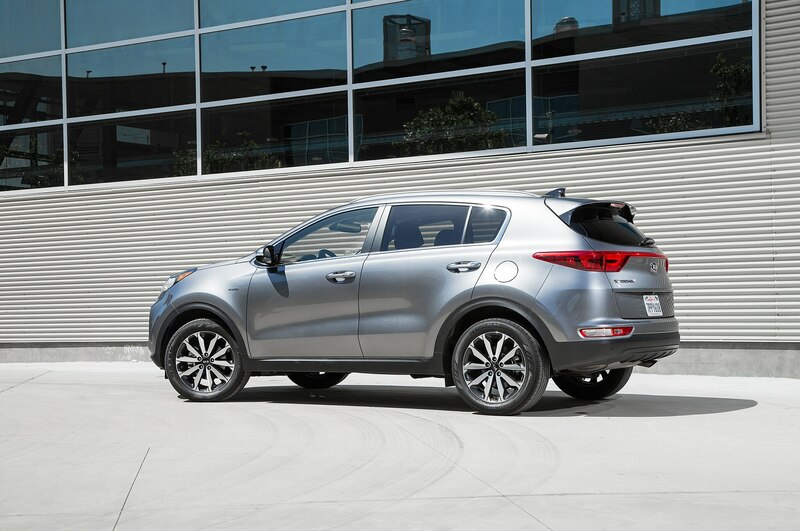 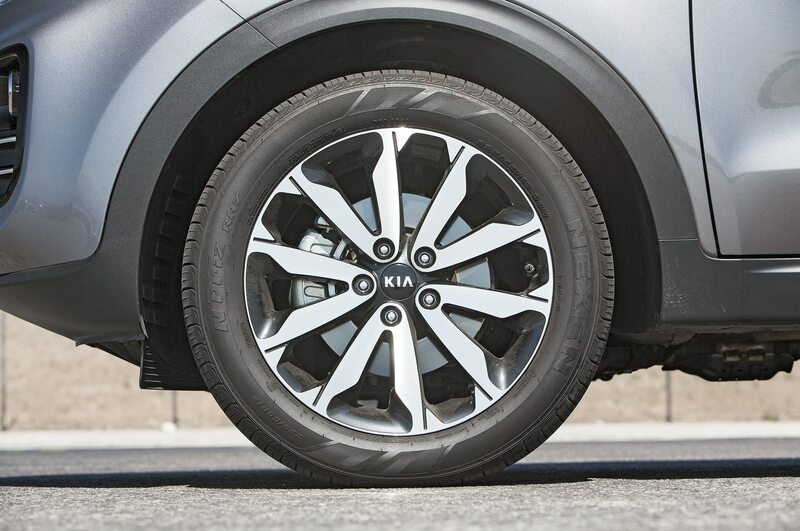 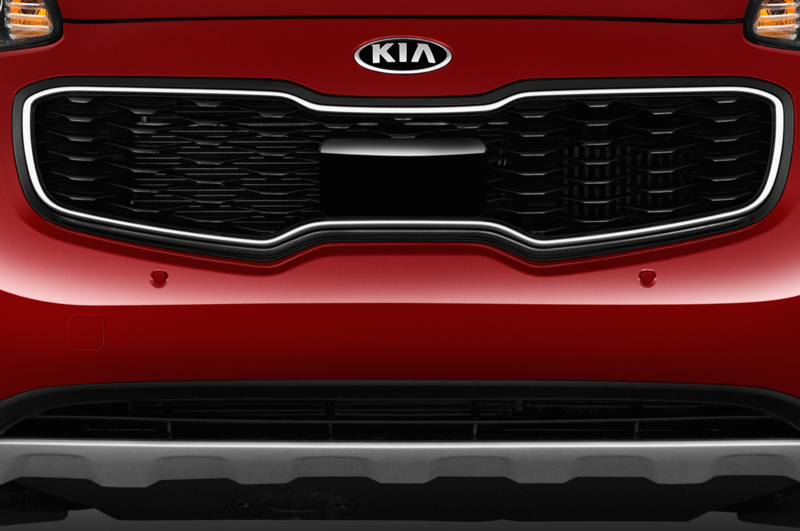 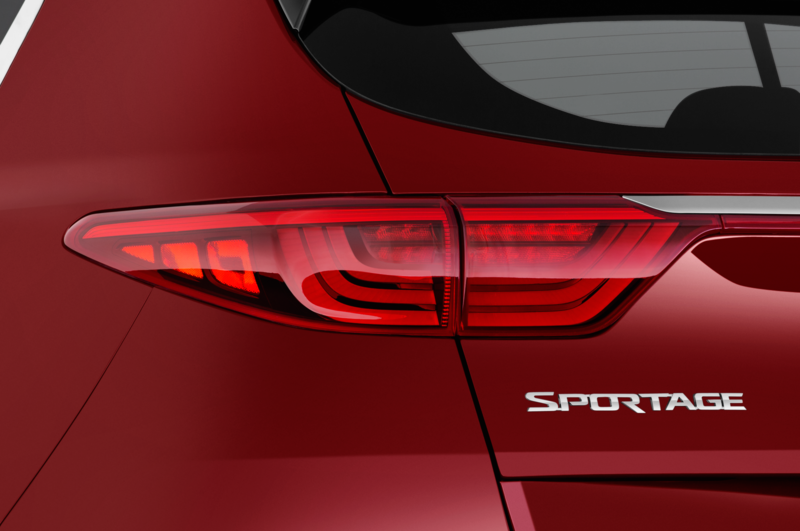 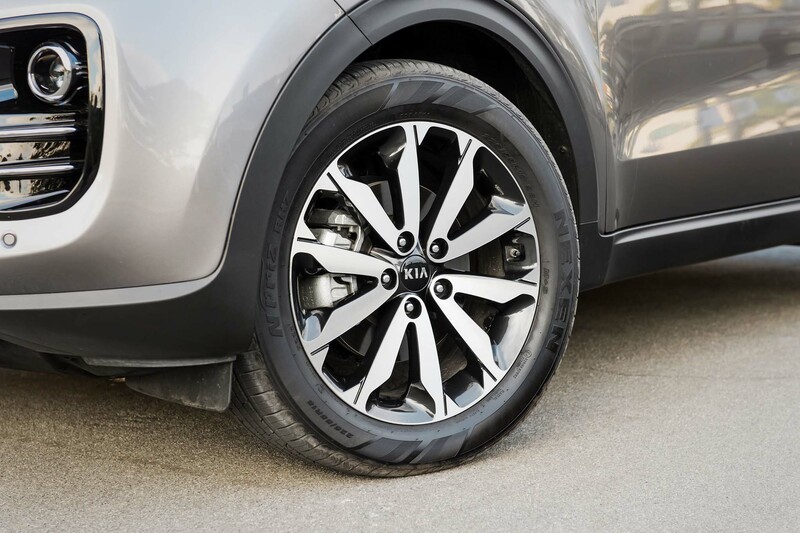 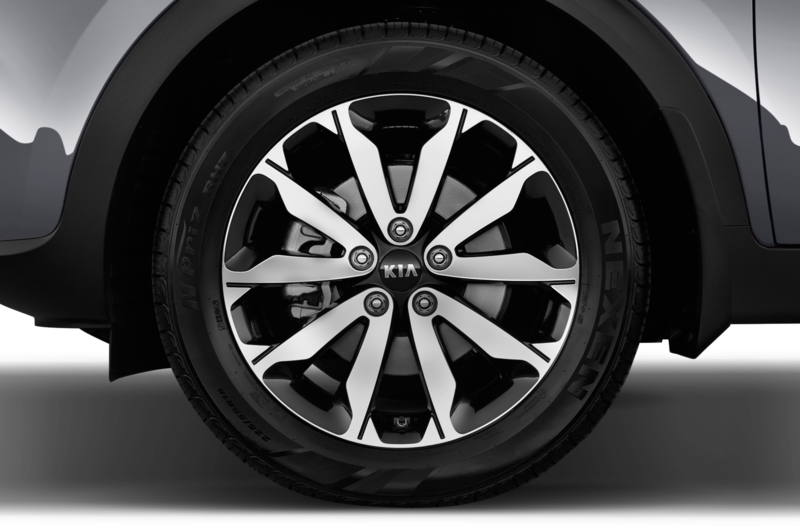 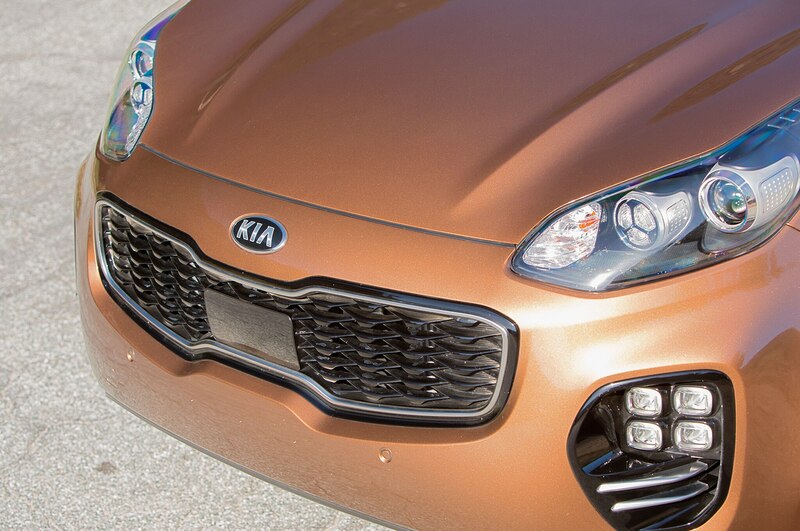 From some angles, the lines of Kia’s compact crossover resemble those of the Porsche Macan or Cayenne. 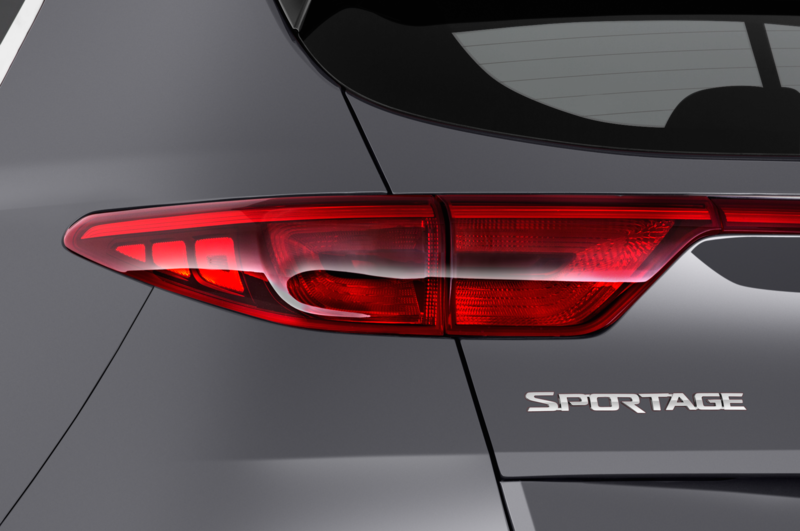 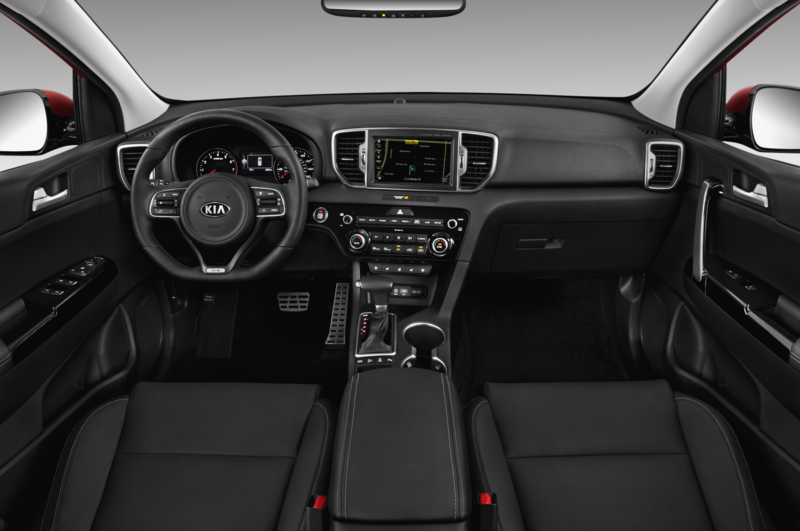 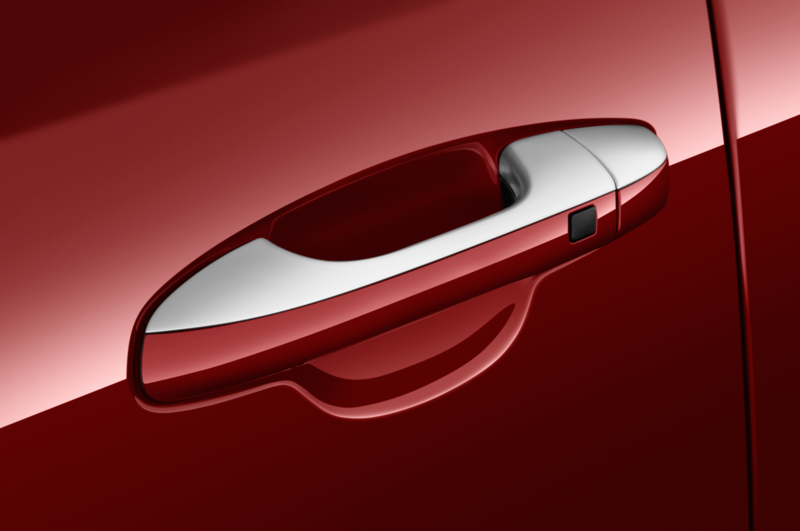 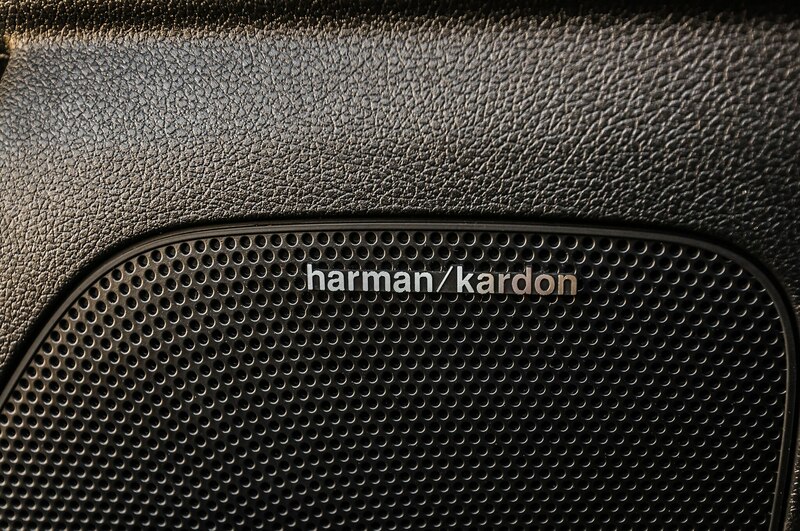 The hand of Hyundai-Kia design chief Peter Schreyer is apparent. 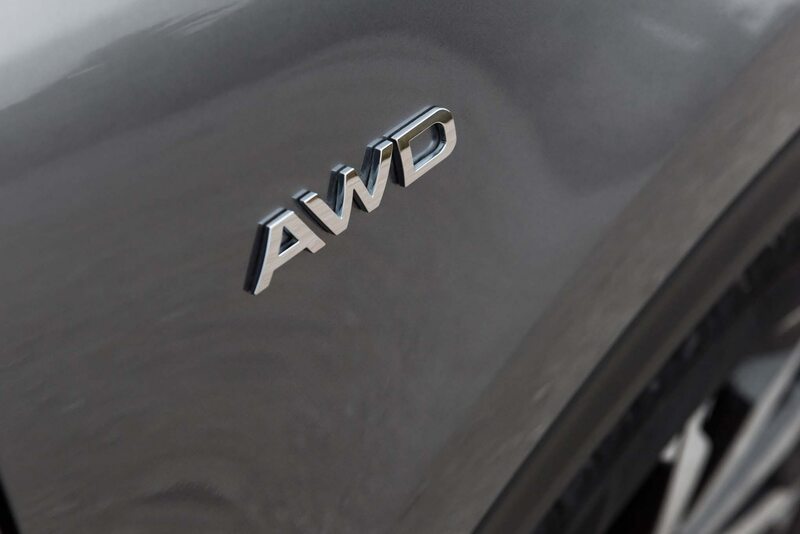 The former Audi designer gave it a bit of a German touch and we like the aggressive design direction. 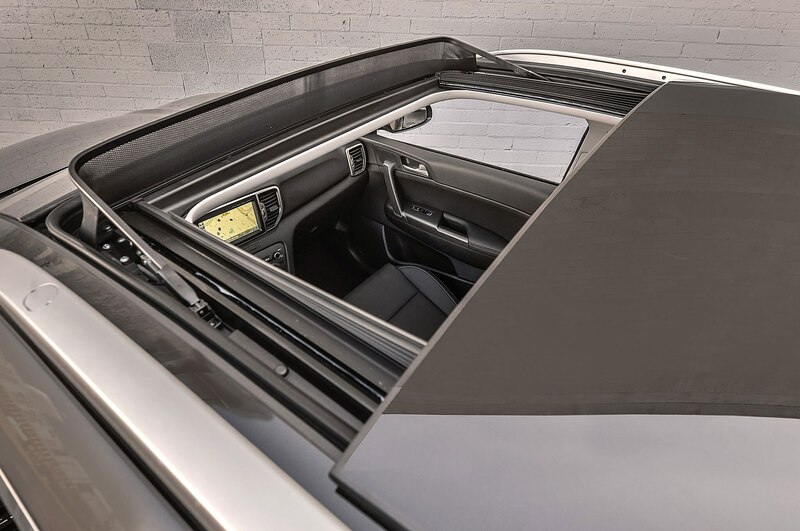 The downside of the sloping roofline and the raked rear window is that it can be a bit of a challenge to see out of at times. 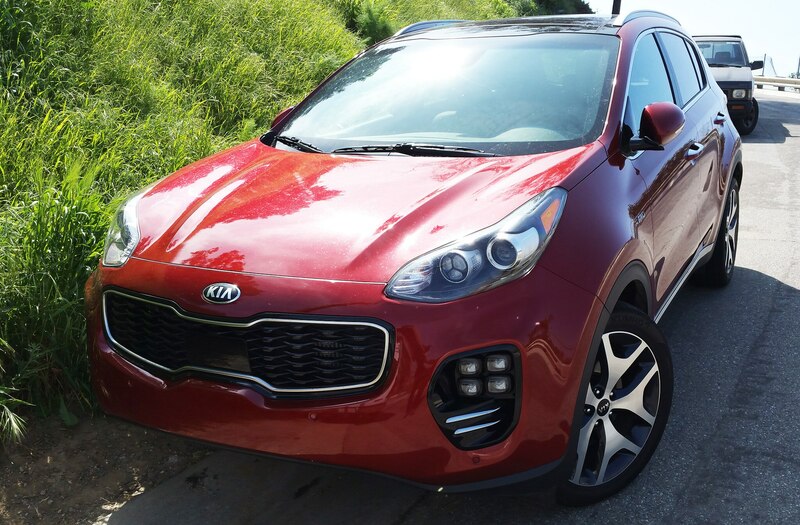 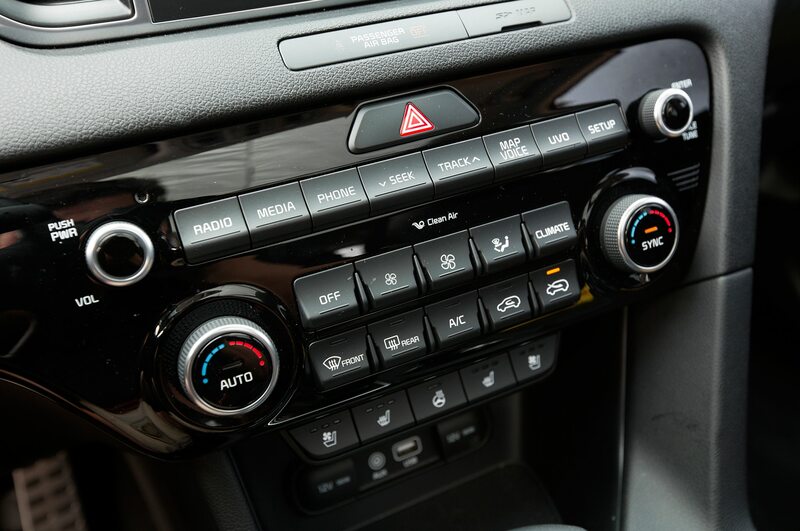 Inside, the Hyper Red Sportage we tested came with a heated and leather-wrapped steering wheel with paddle shifters, and sporty aluminum alloy pedals. 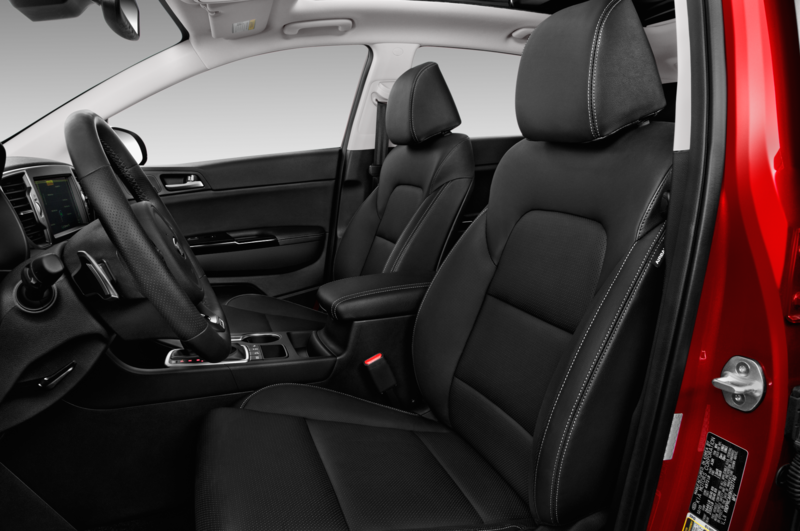 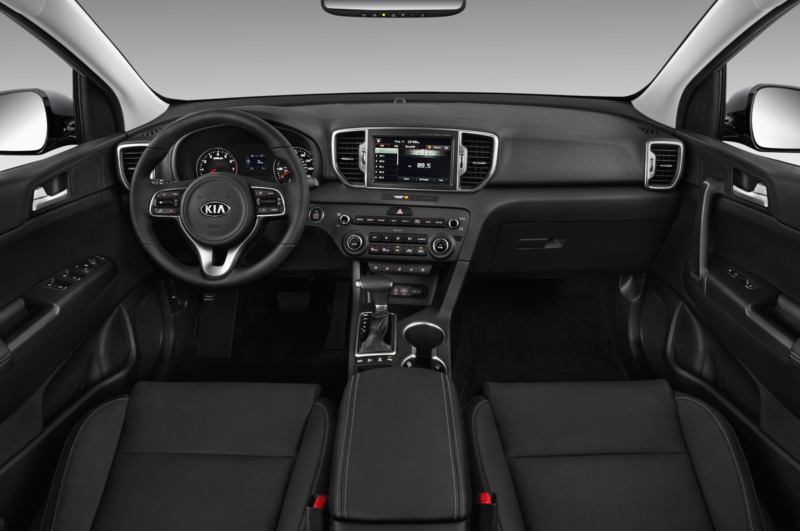 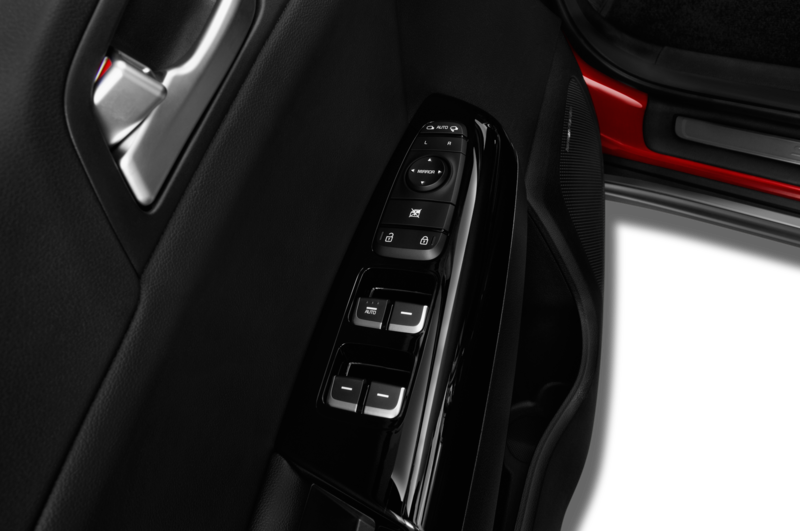 It featured piano black trim along the center console, heated and ventilated front seats in gray leather. 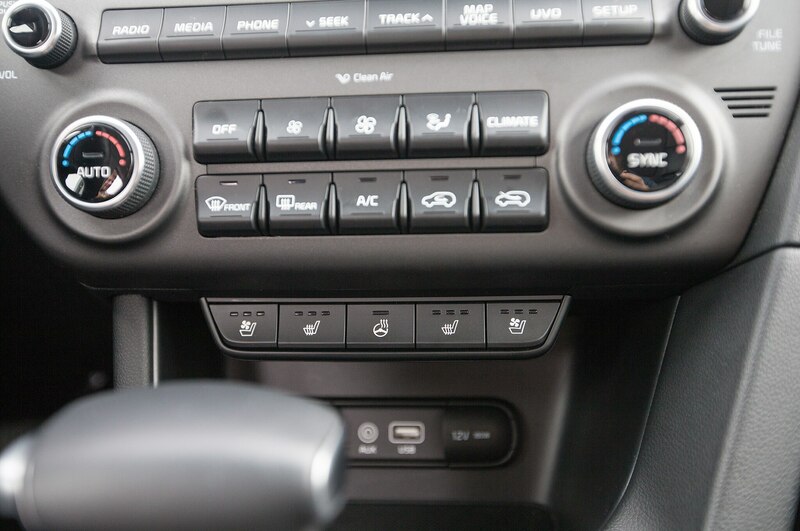 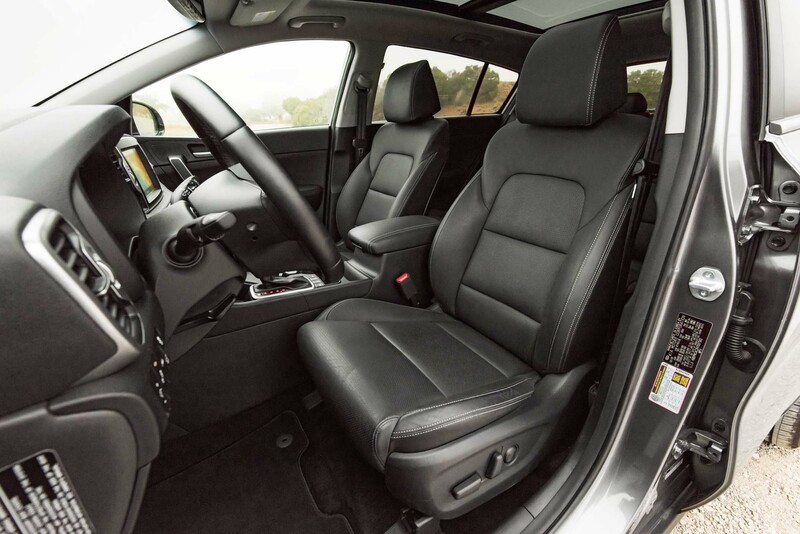 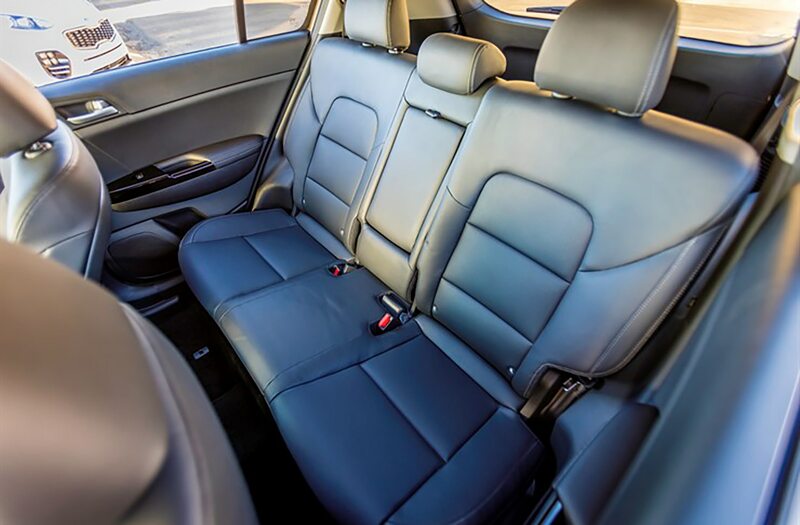 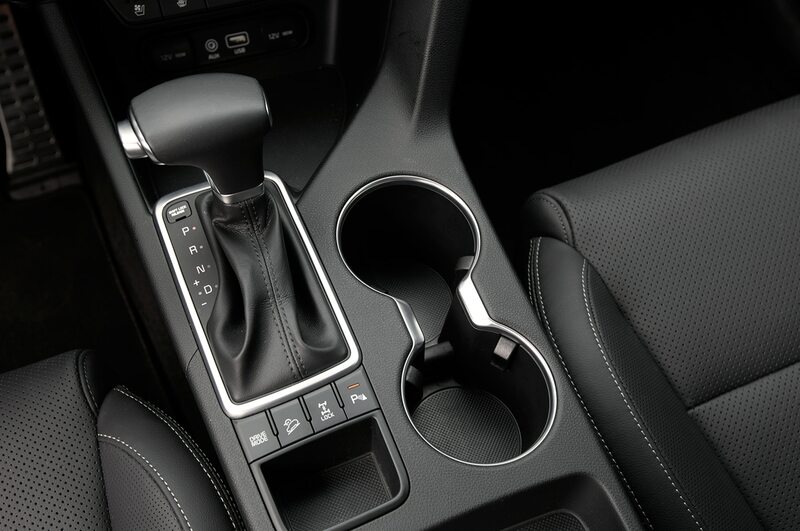 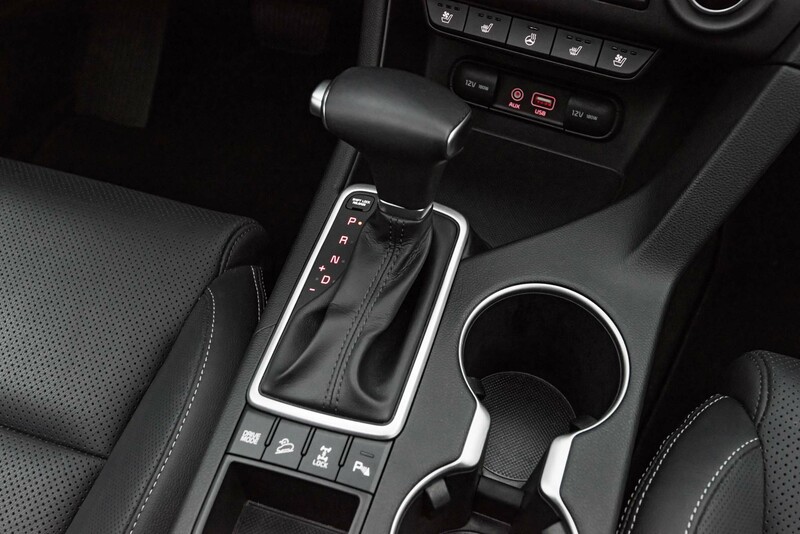 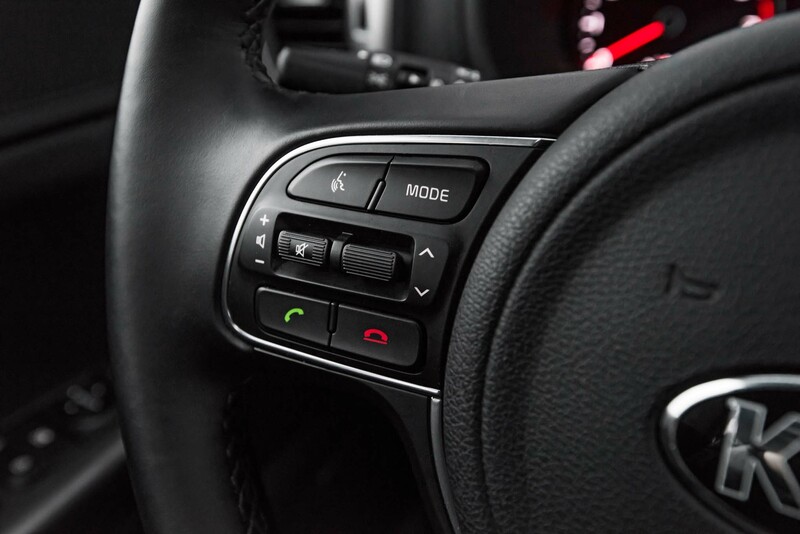 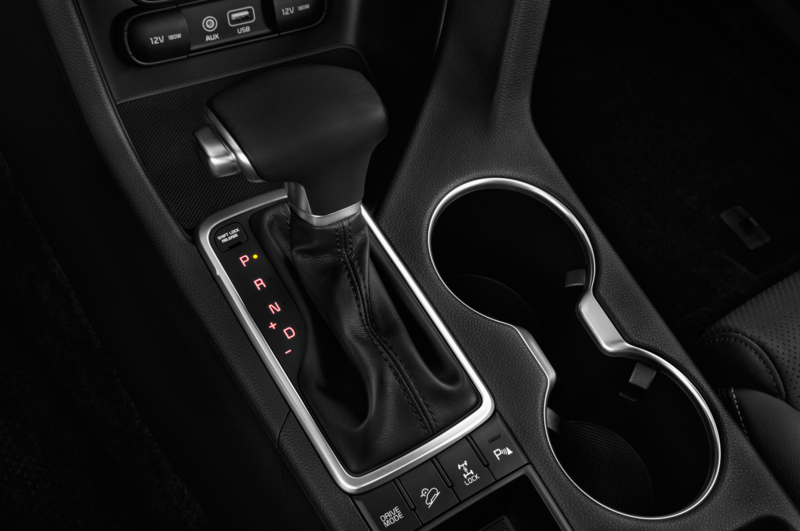 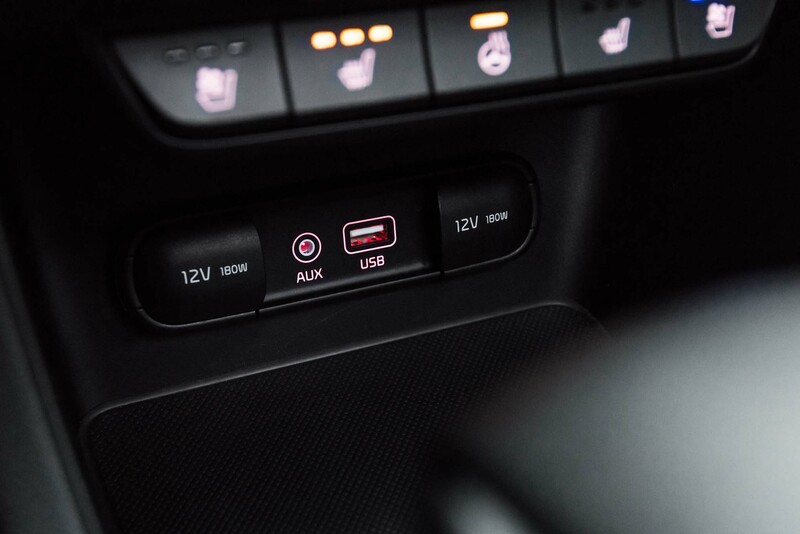 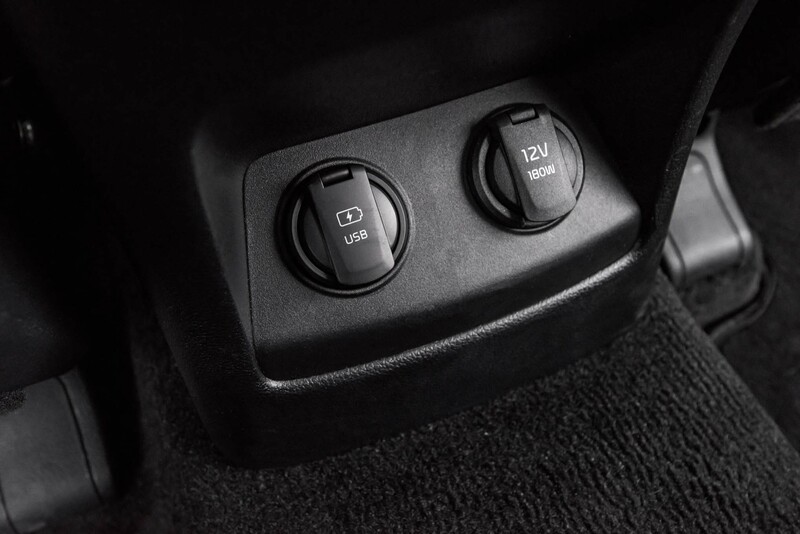 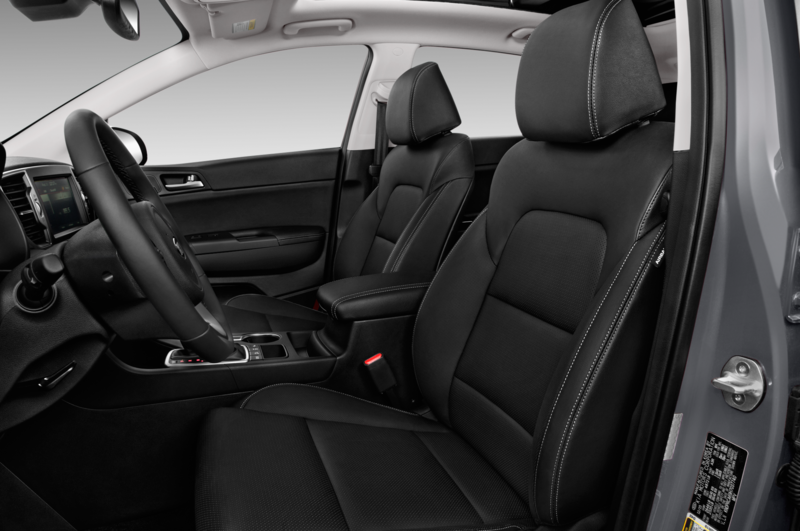 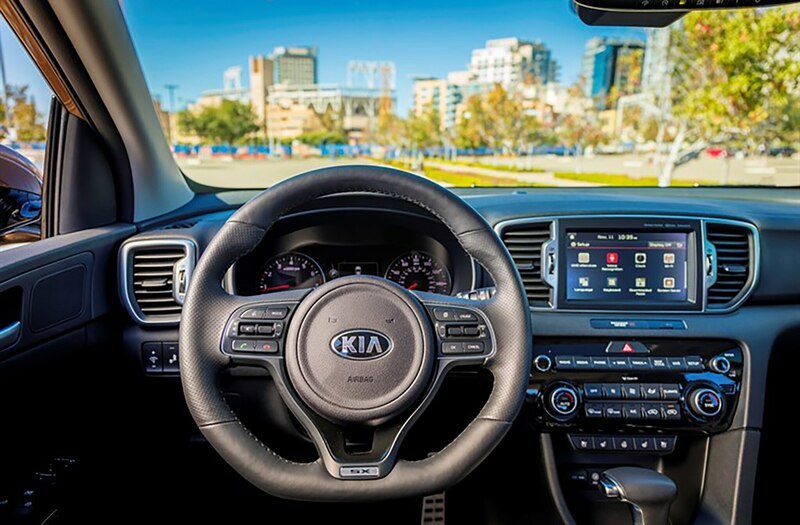 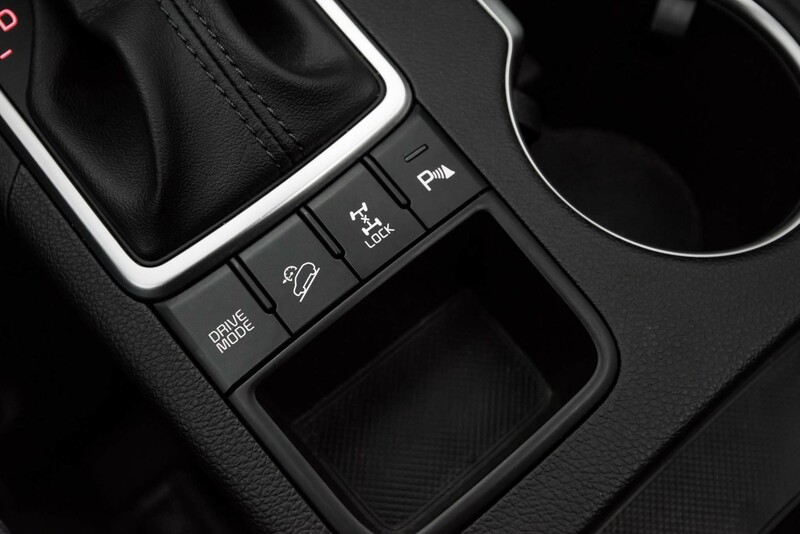 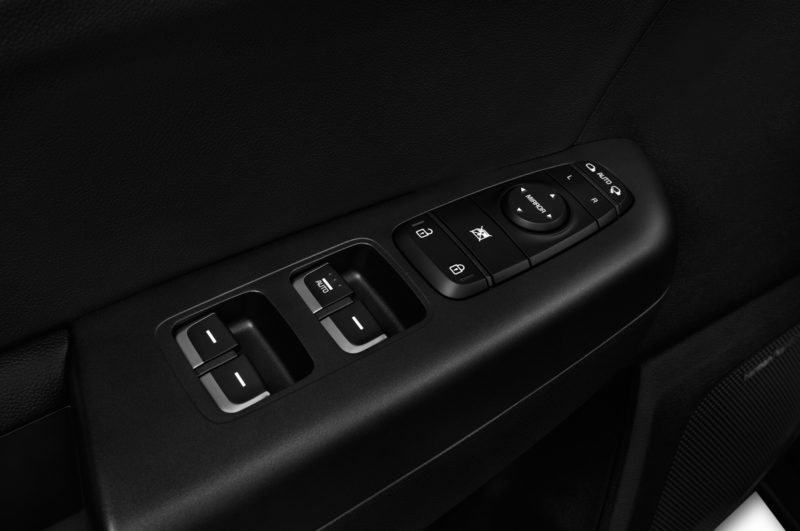 The driver’s seat offers 10-way power control with lumbar support and the passenger seat gets an eight-way power control — all standard for the SX models. 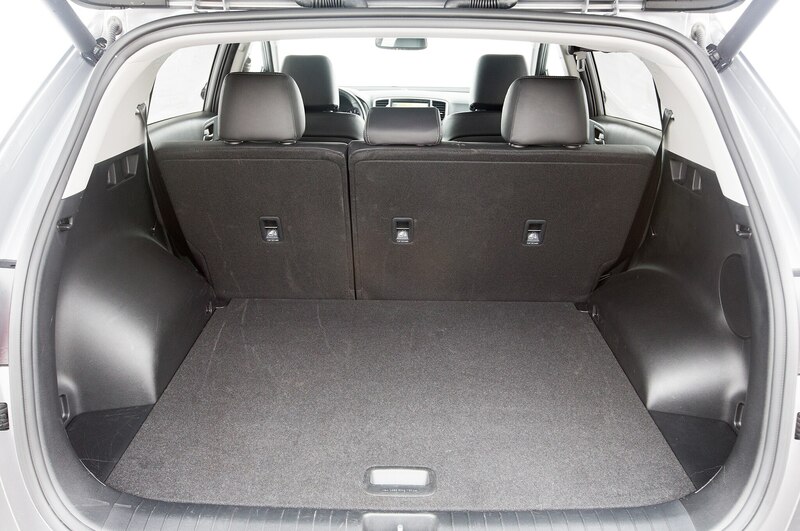 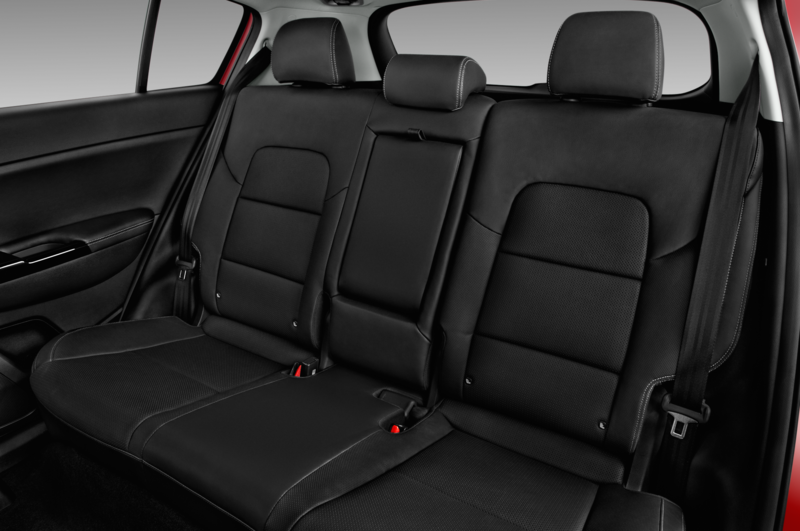 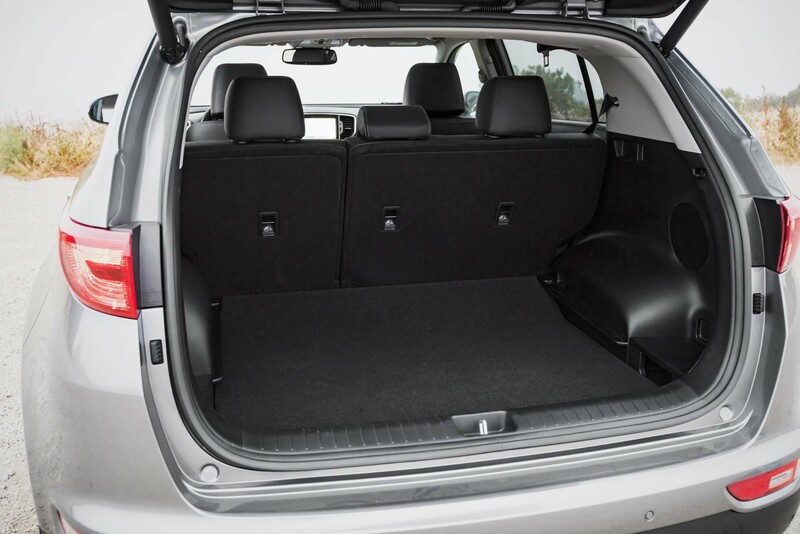 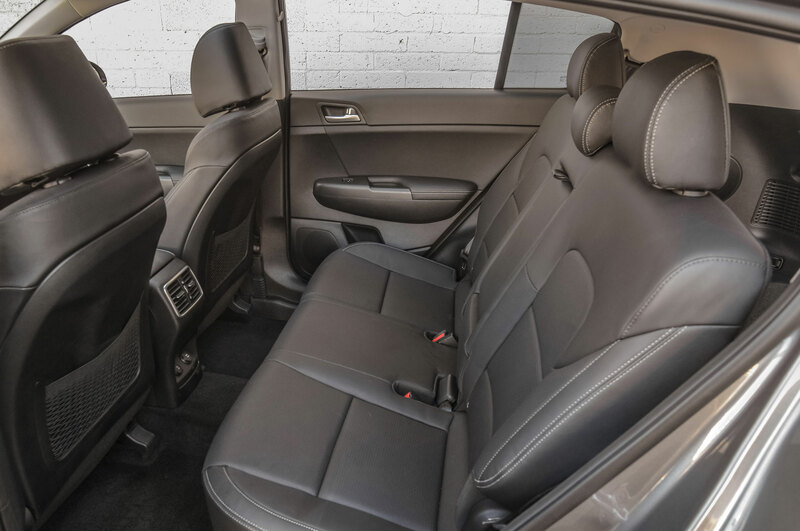 Kia says the cargo capacity behind the second row seats is 30.7 cu.-ft. and it doubles up to 60.1 cu.-ft. behind the first row with the seats folded. 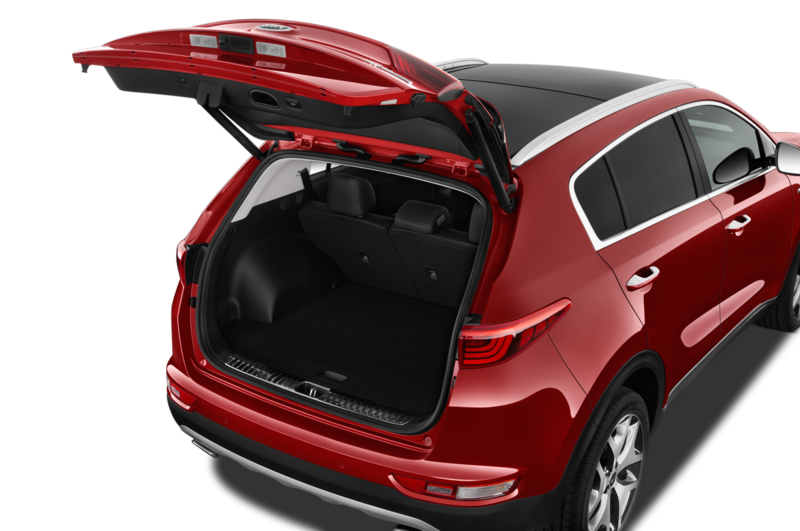 Total cargo volume is 129.3 cu. 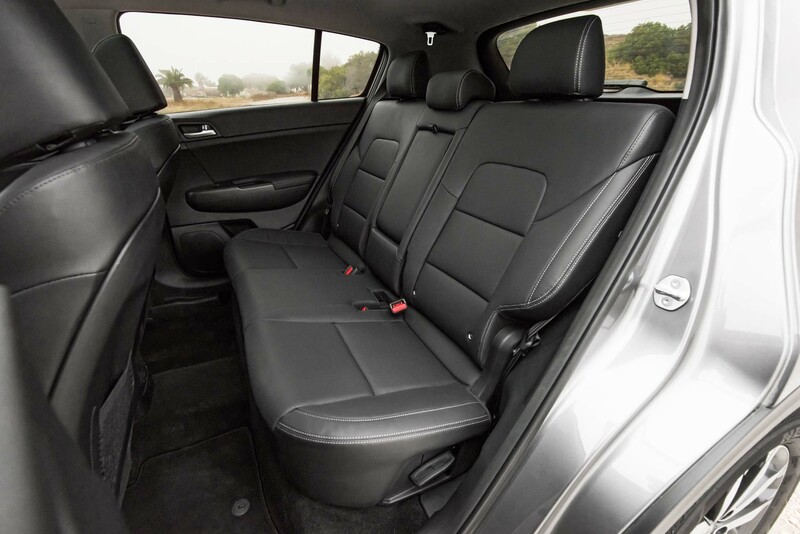 ft. There’s 37.9 inches of headroom, 41.5 inches of legroom, and 57.1 inches of shoulder room for its passengers. 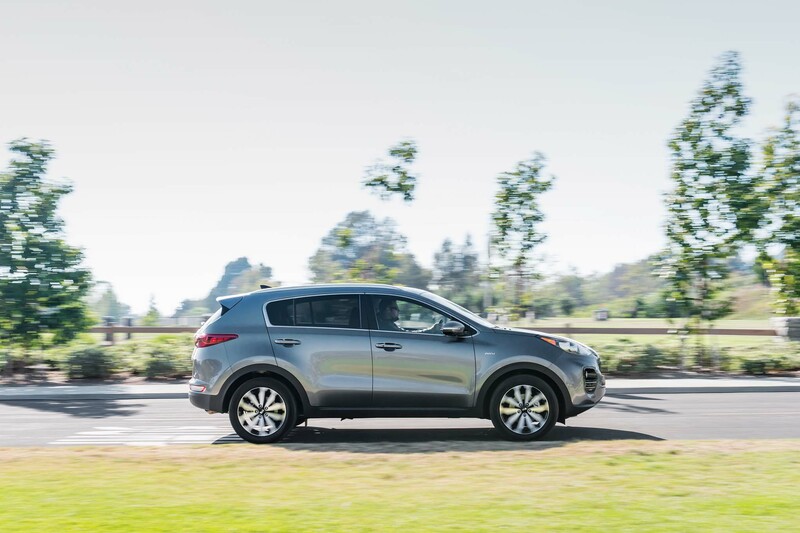 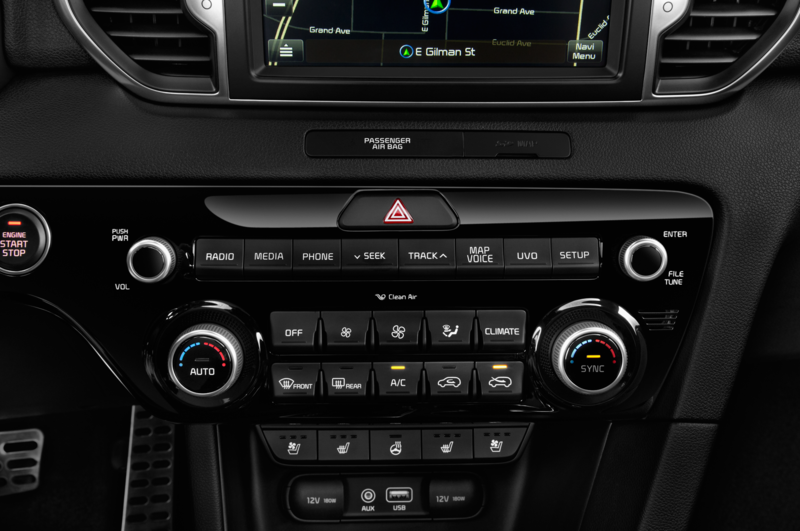 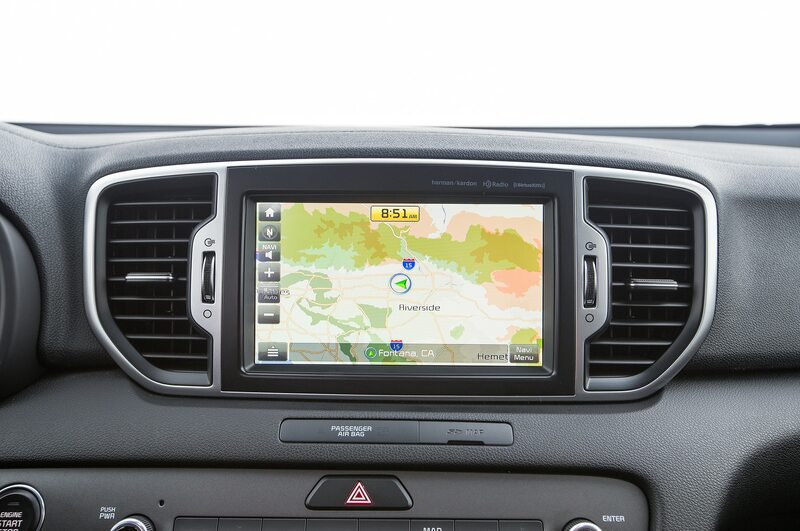 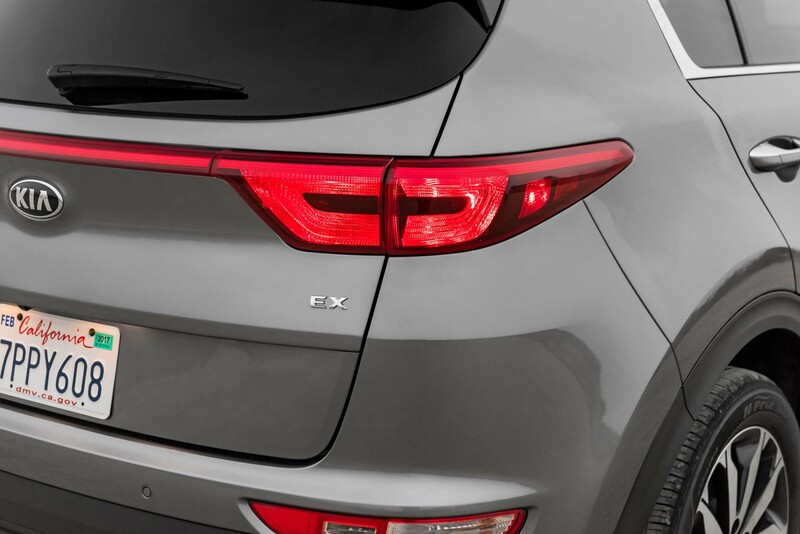 Safety wise, the 2017 Sportage SX comes with lane departure warning, blind spot detection with lane change assist, rear cross traffic alert, and front and rear parking assist. 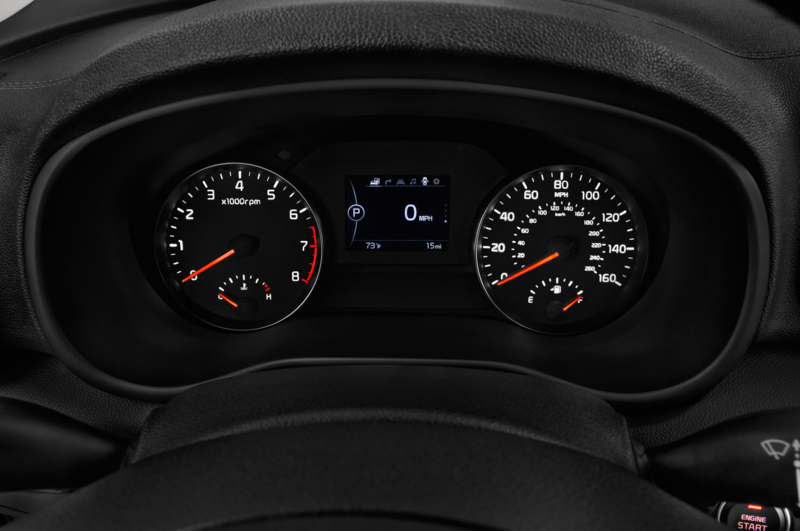 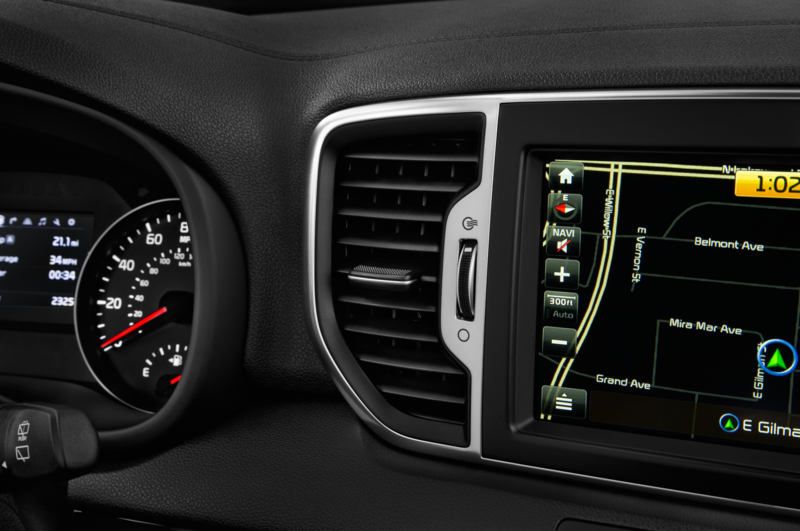 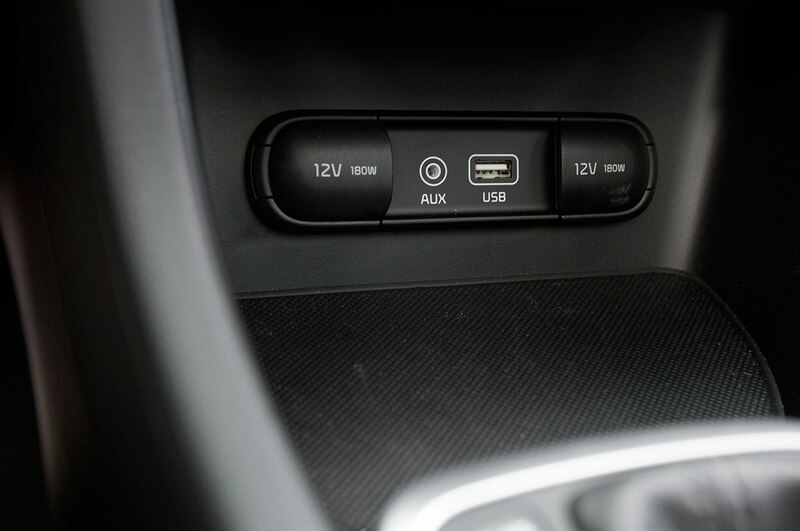 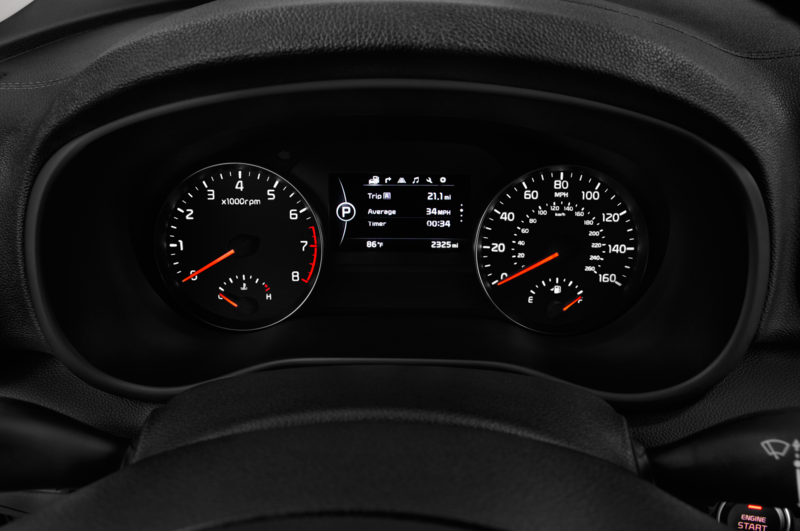 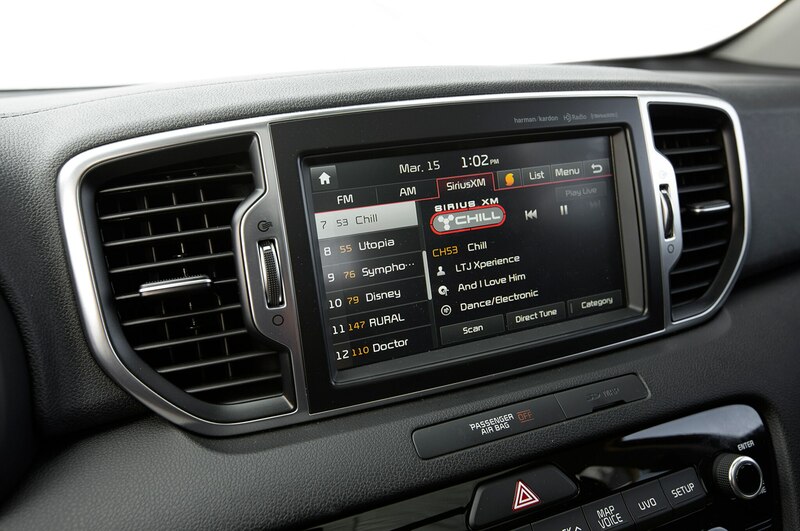 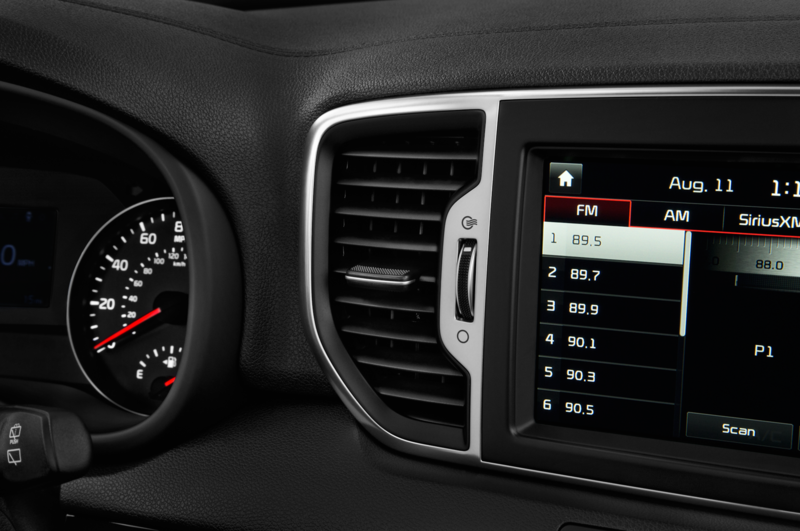 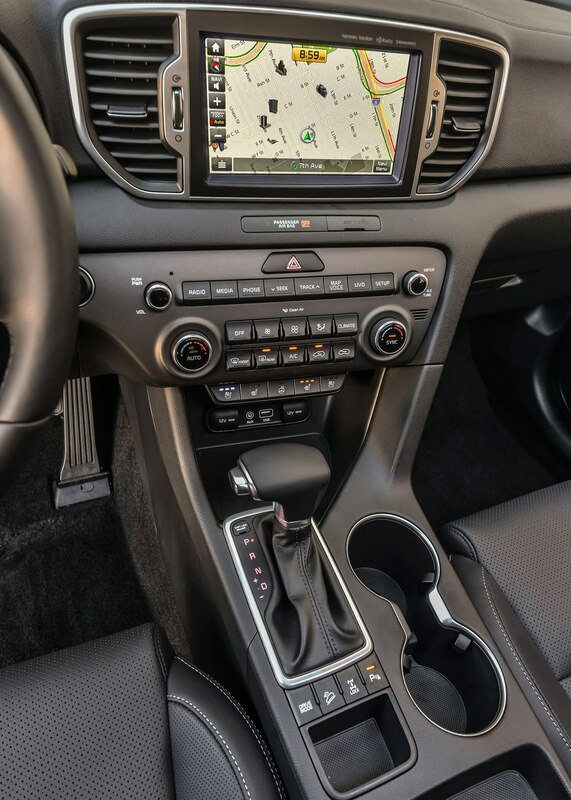 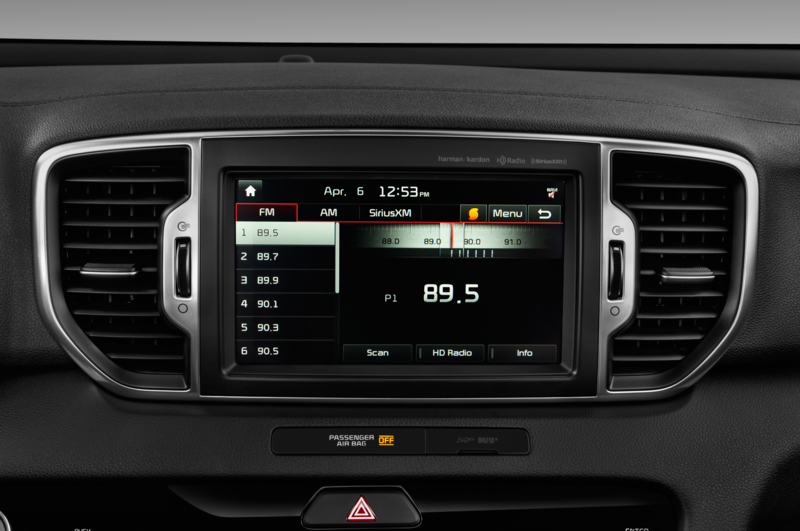 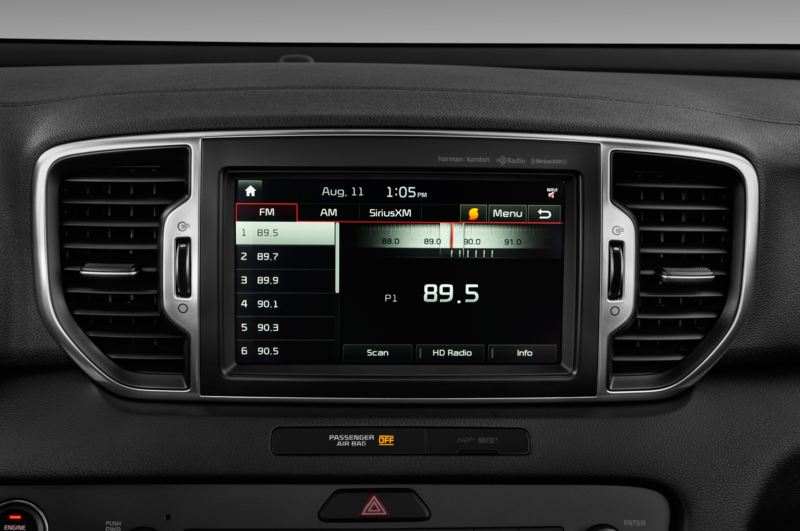 The SX has an 8-inch touchscreen, onboard navigation, and is Android Auto and Apple CarPlay friendly. 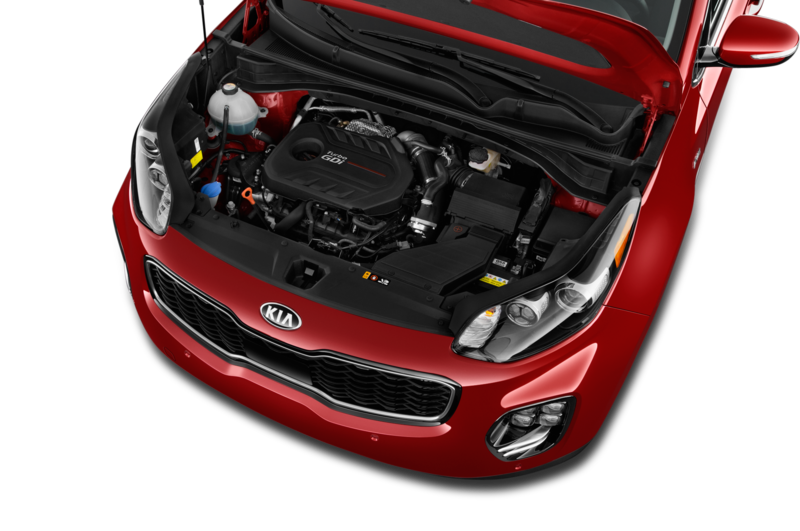 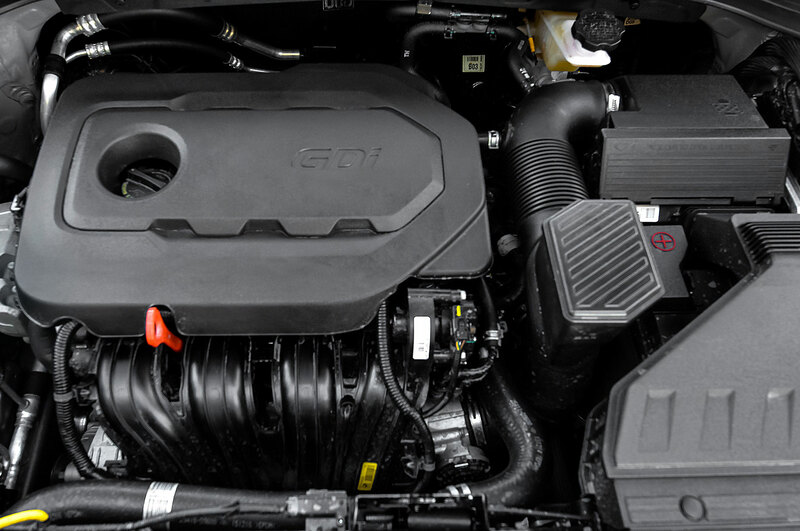 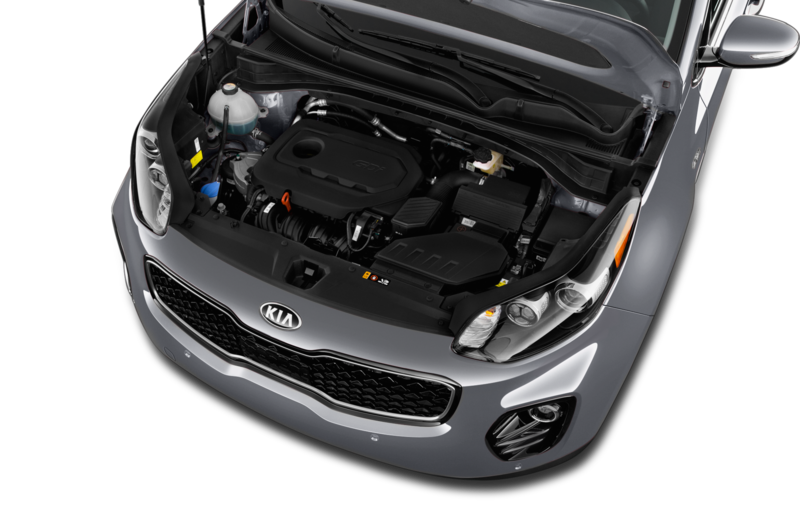 Under the hood, the Sportage SX packs a turbocharged 2.0-liter inline four-cylinder engine that makes 237 hp and 260 lb-ft of torque. 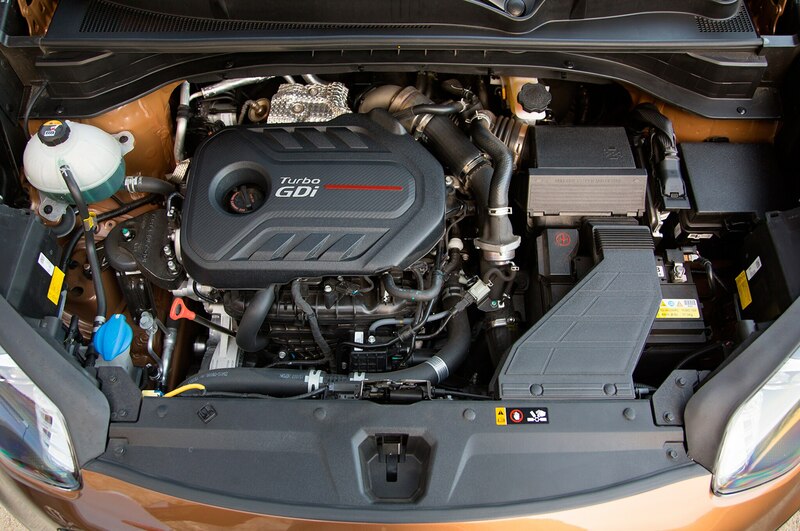 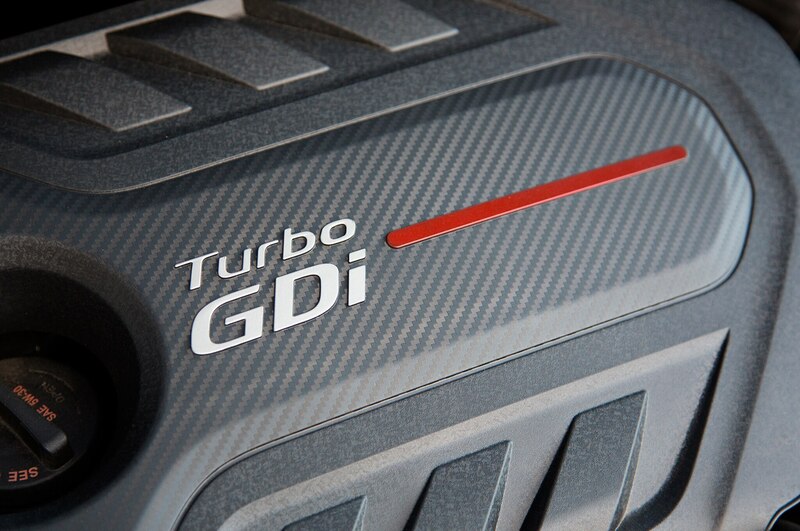 The peppy engine is mated to a silky six-speed automatic transmission. 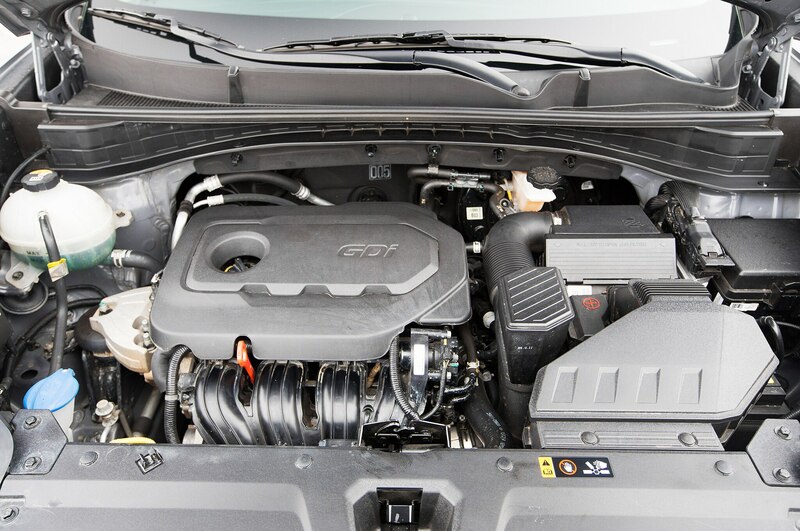 In our tester, power was sent to all four wheels, resulting in a respectable fuel economy rating of 20/23 mpg city/highway. 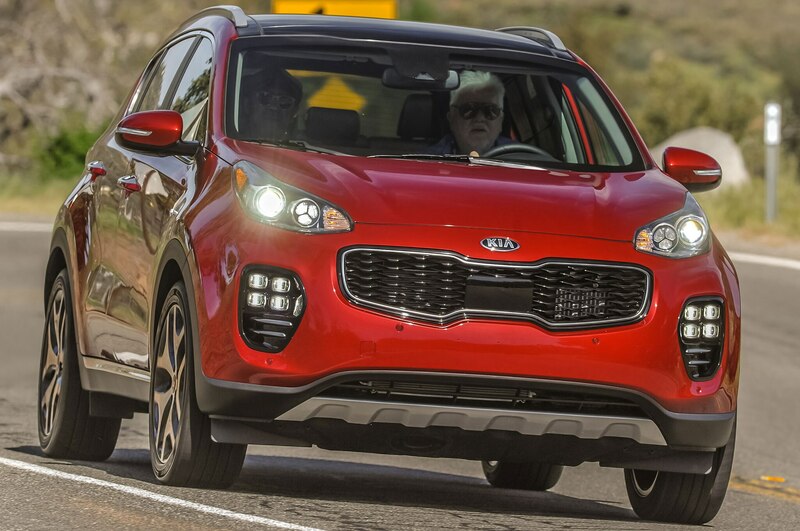 Suspension is tight and stabile — even on twisty, canyon roads — thanks to its multilink rear suspension and redesigned MacPherson struts up front. 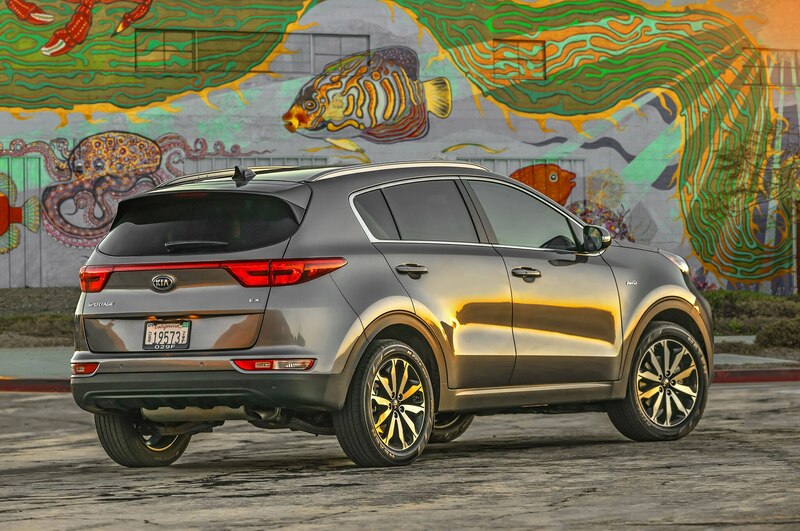 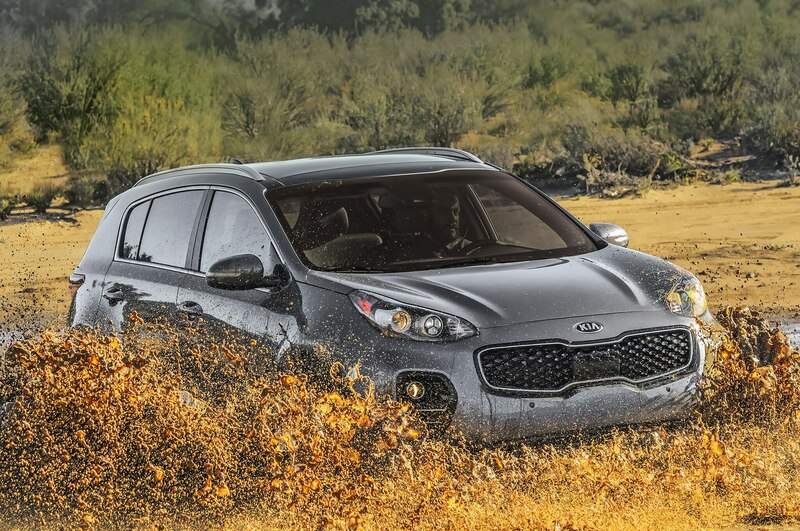 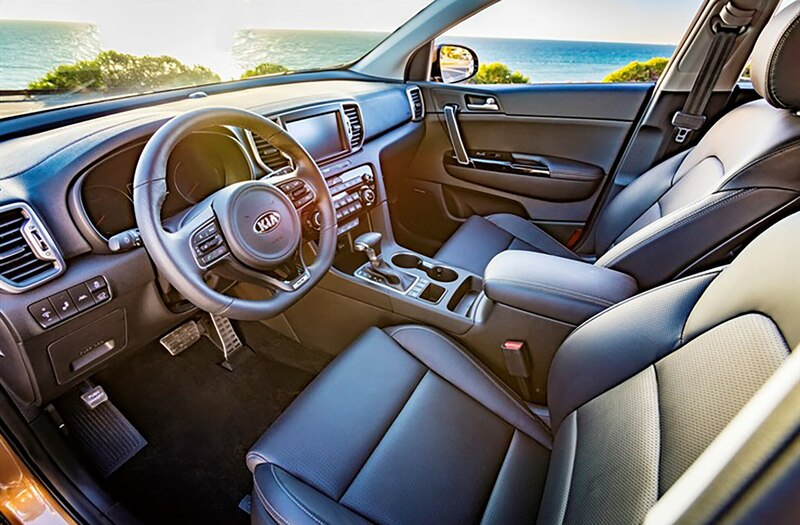 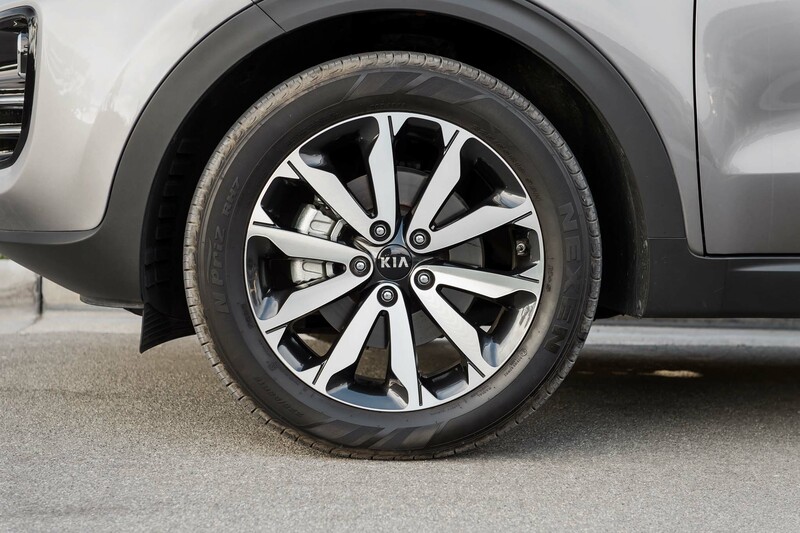 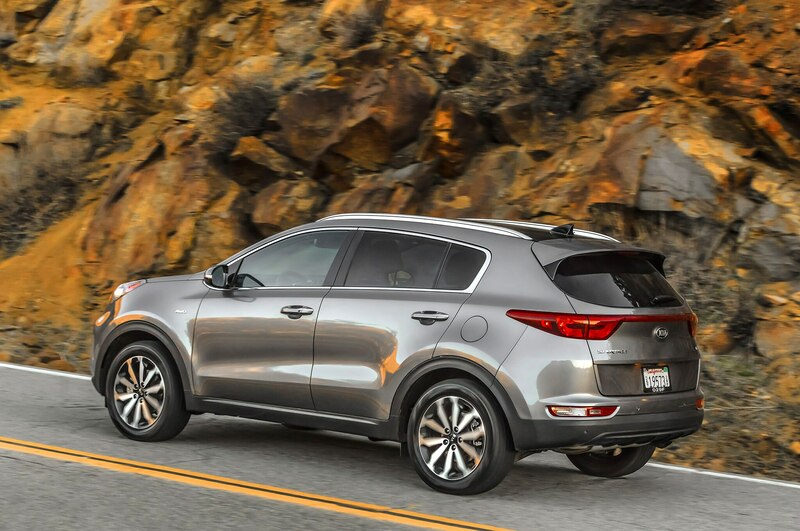 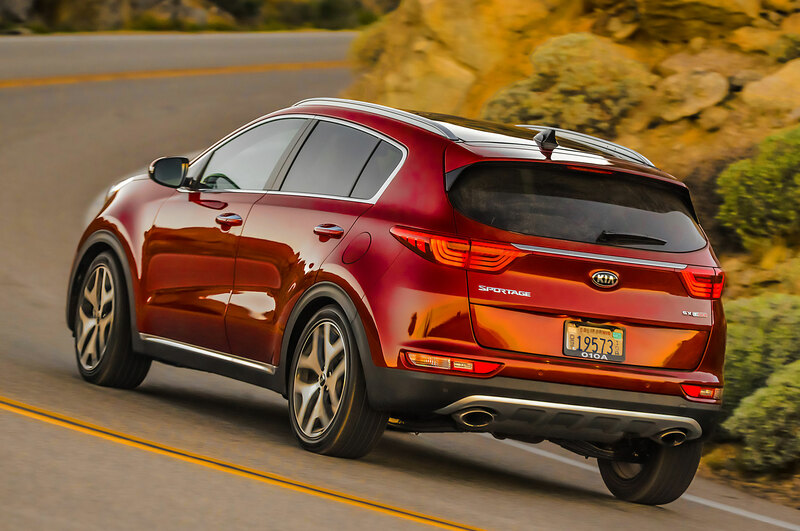 The all-wheel-drive option helps keep the SUV firmly planted on the highway and it can even tow up to 2,000 pounds Kia claims. 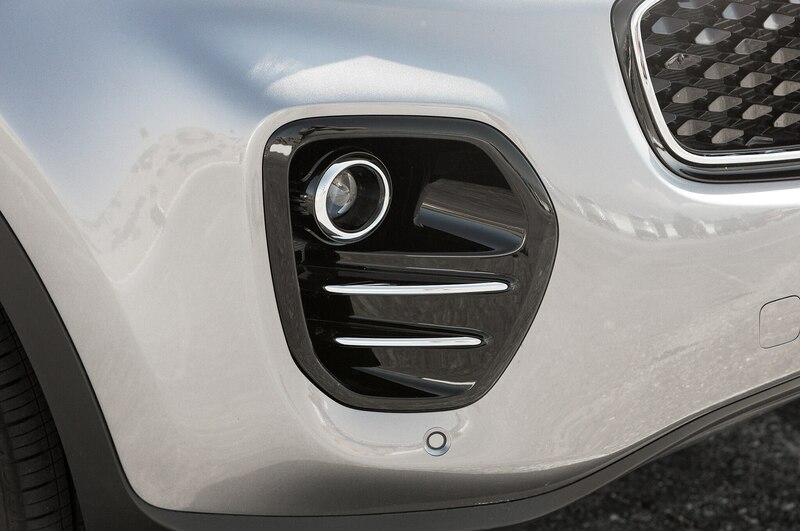 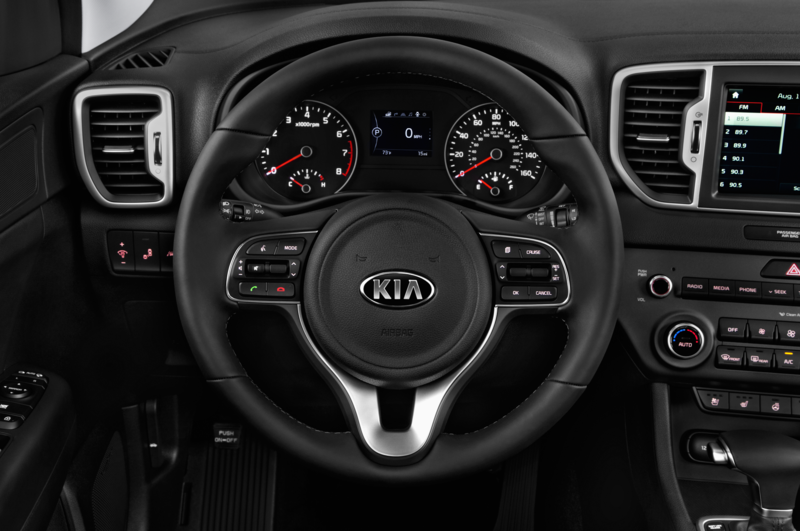 The electric power steering feels precise and more than adequate for most urban driving conditions. 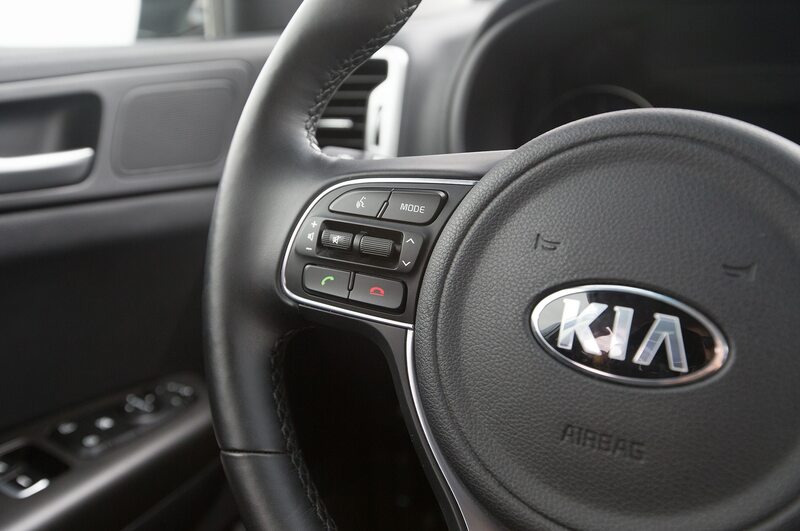 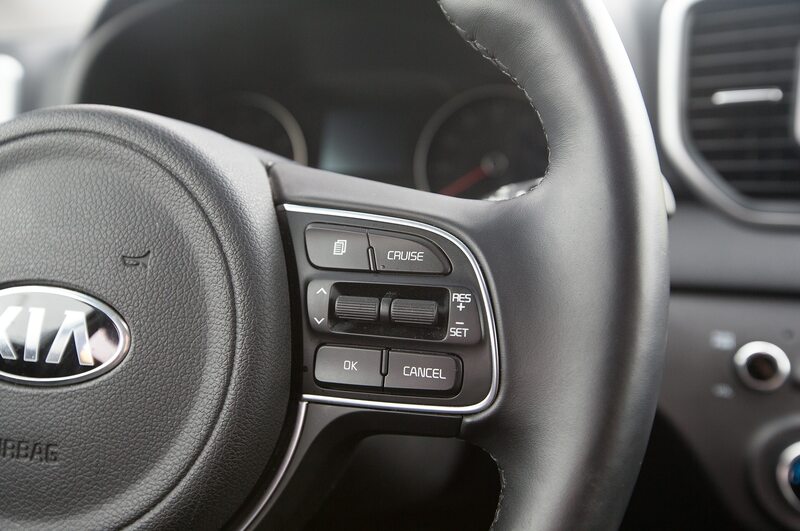 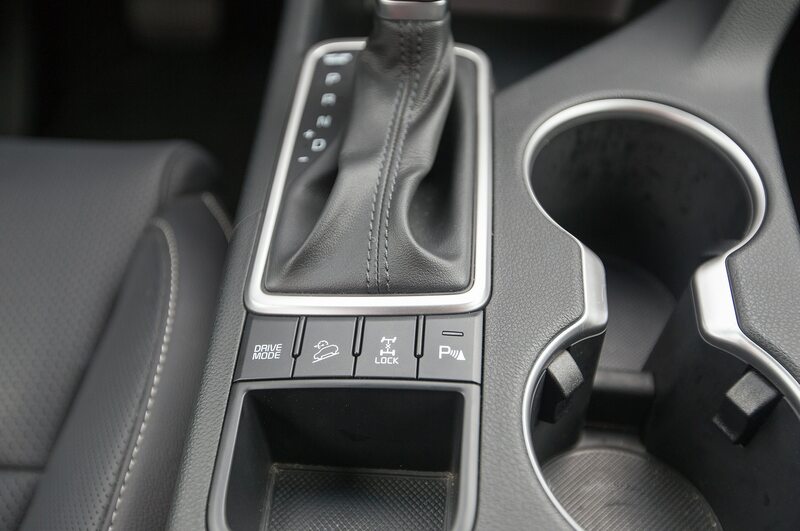 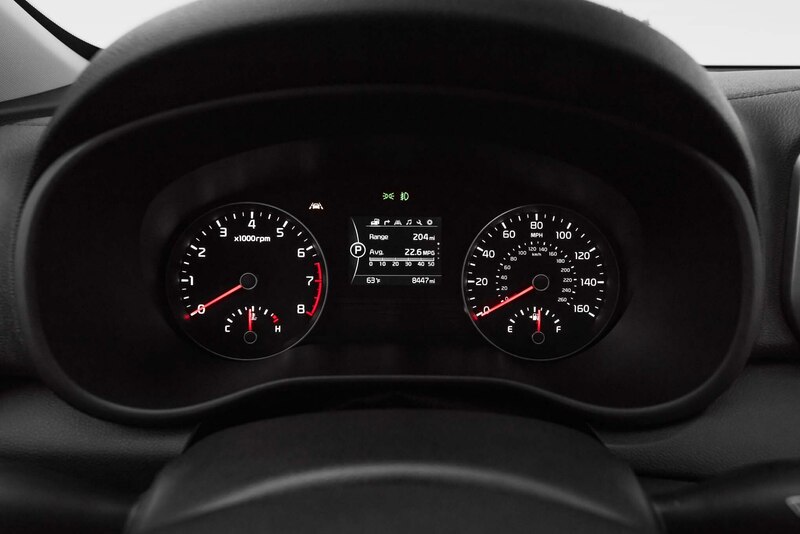 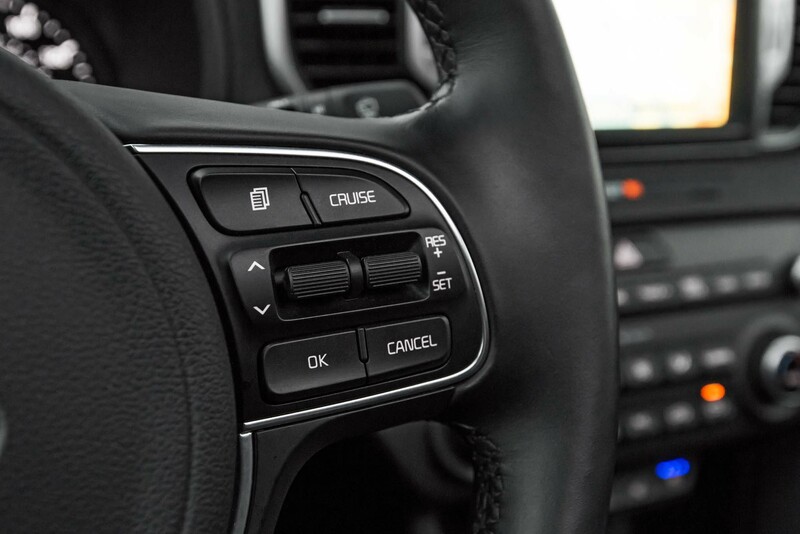 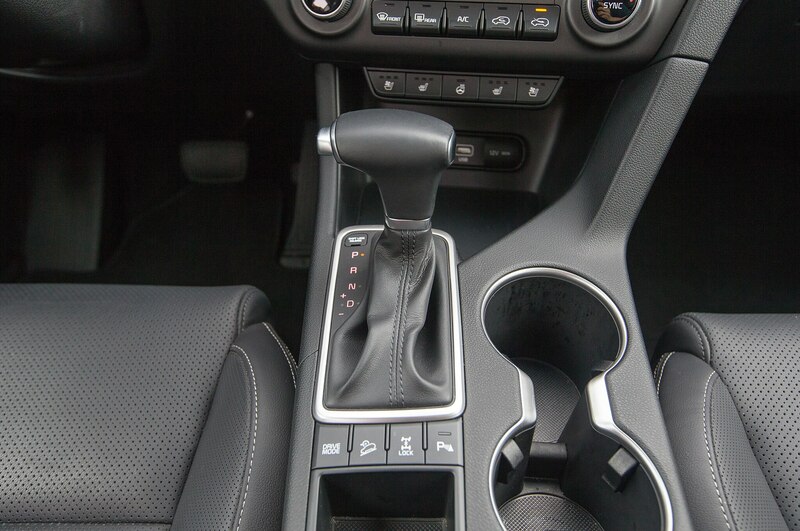 Its paddle shifters are also handy if you are feeling a bit racy. 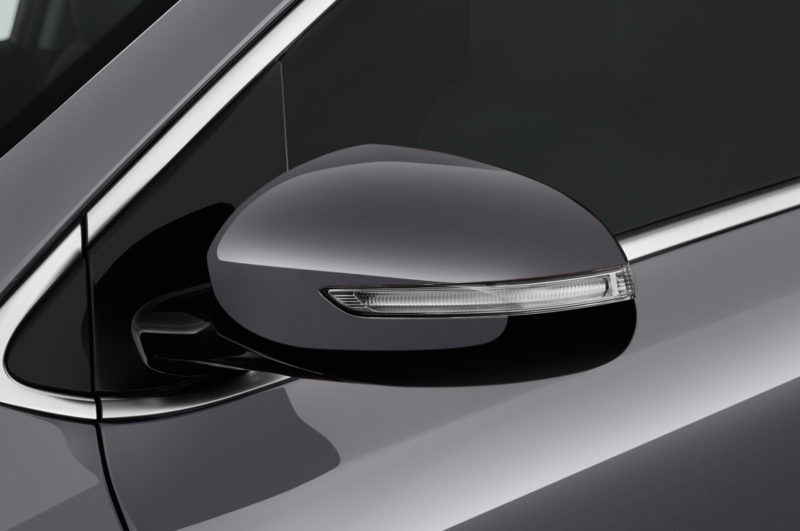 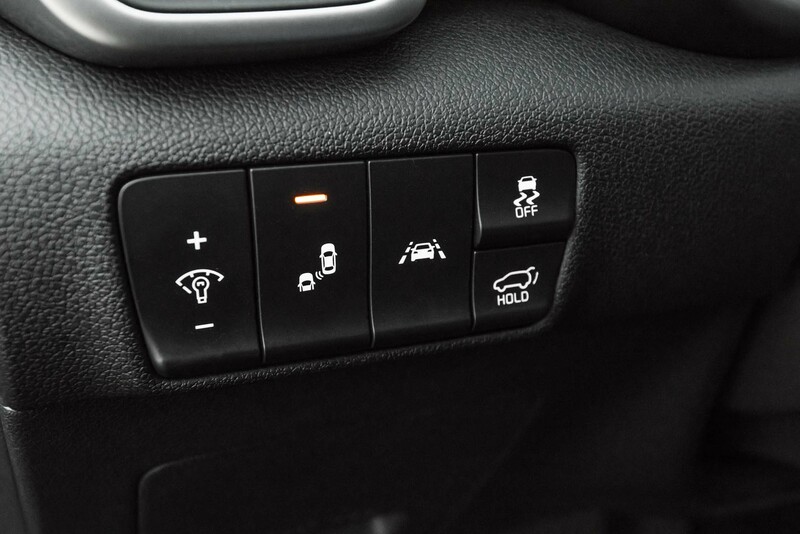 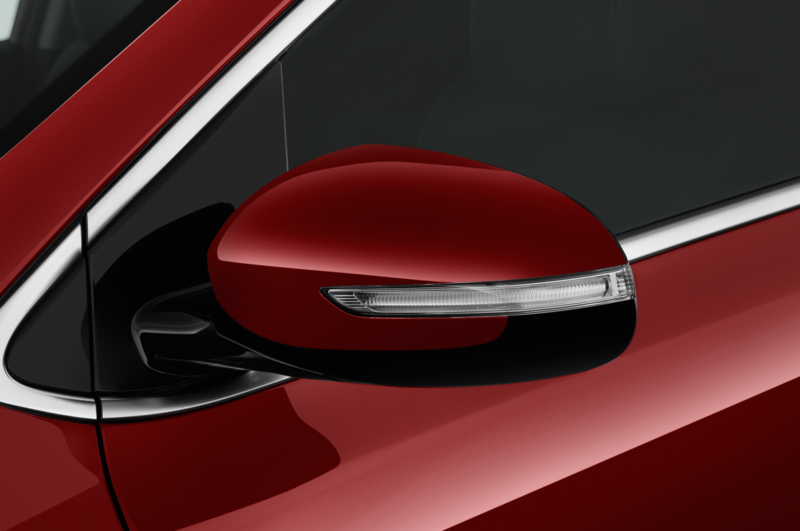 ABS is standard to help slow it down and the SX trim also includes automatic emergency braking with pedestrian detection in case you forget to stop. 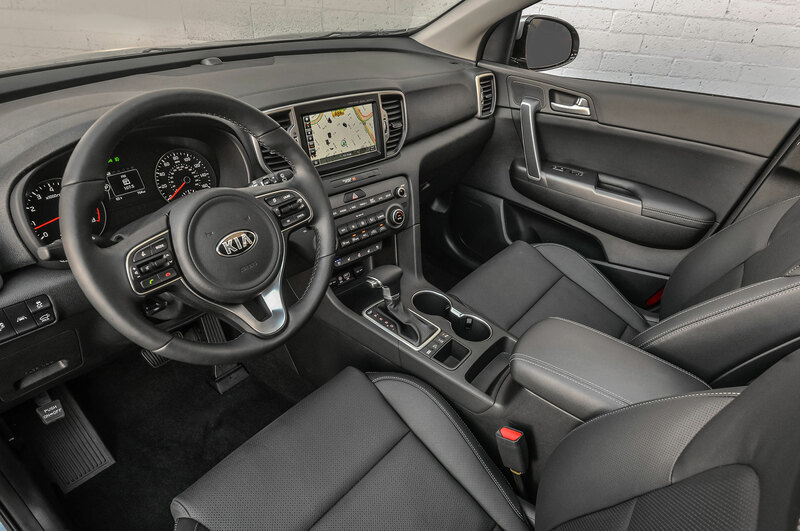 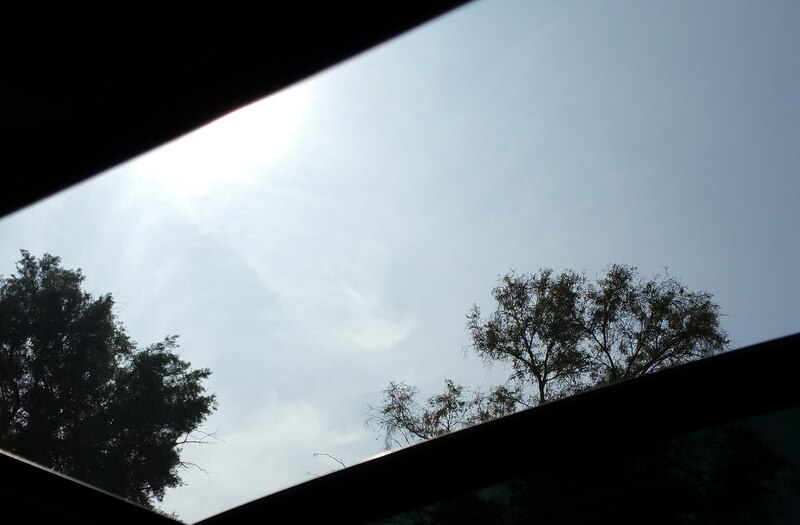 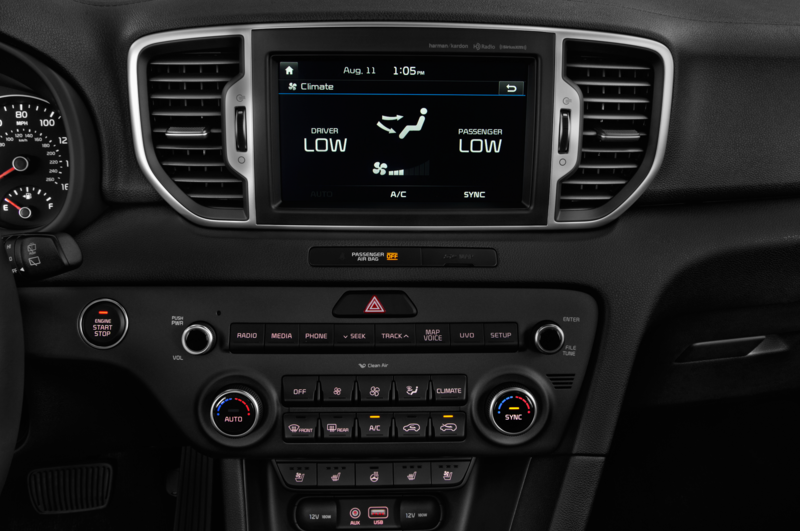 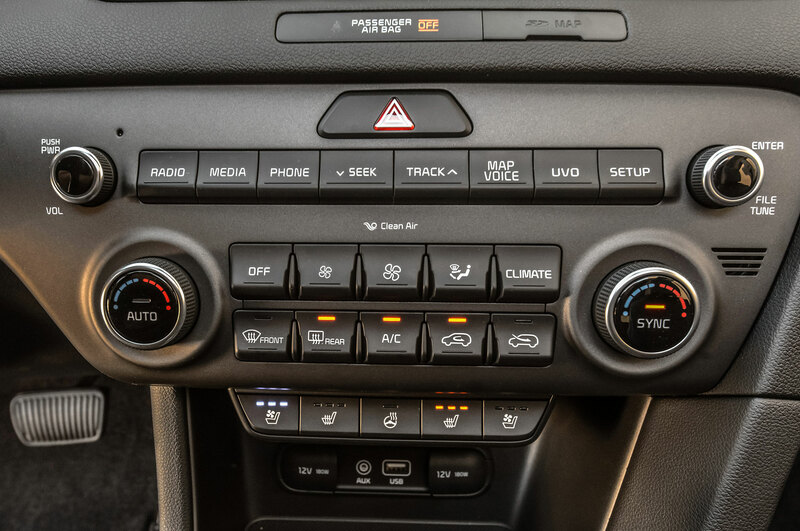 Cabin noise is kept to a minimum, thanks to thicker front side glass, a lip seal for the panoramic sunroof, and additional soundproofing in the doors. 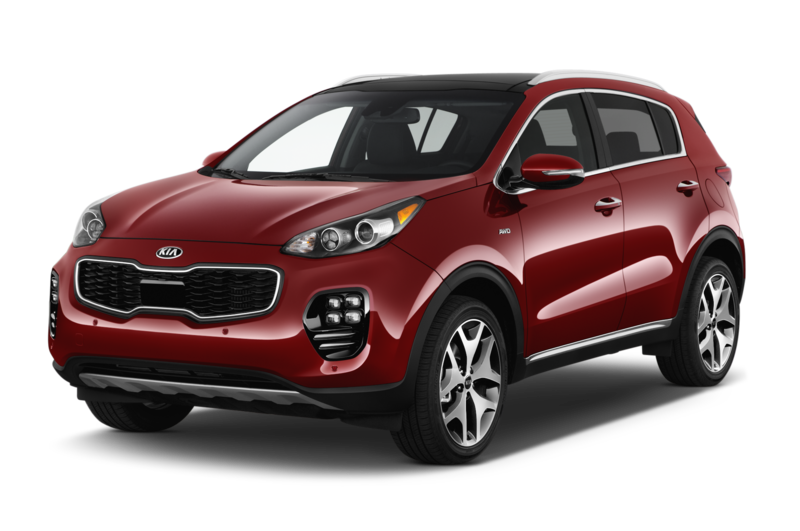 While you can find better mileage numbers from its competitors at Honda, Nissan, and Subaru, they don’t sport a cute mug like the Sportage. 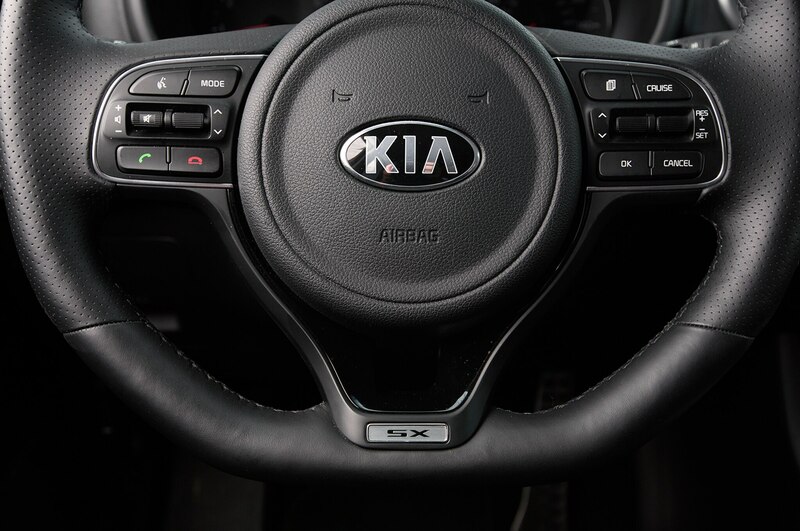 The SX offers an engaging ride, unique looks, and a decent amount of goodies in a fun little package. 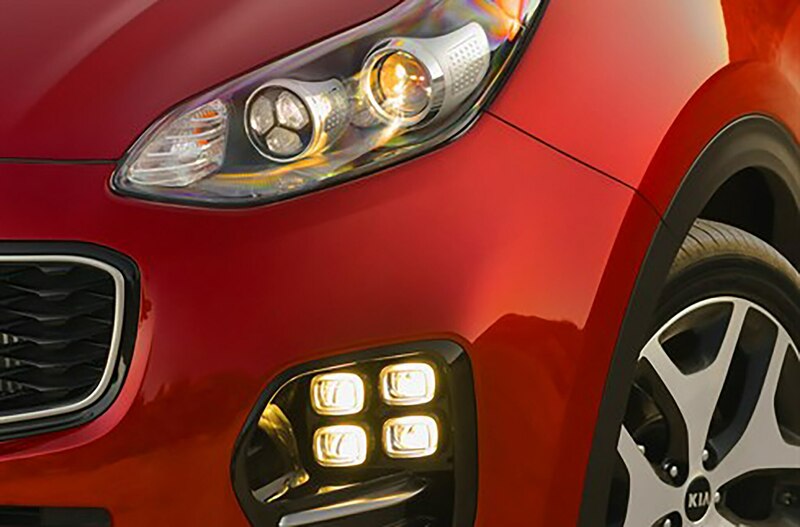 It’s definitely worth a closer look and a test-drive if you are cross-shopping with similar brands at this price.